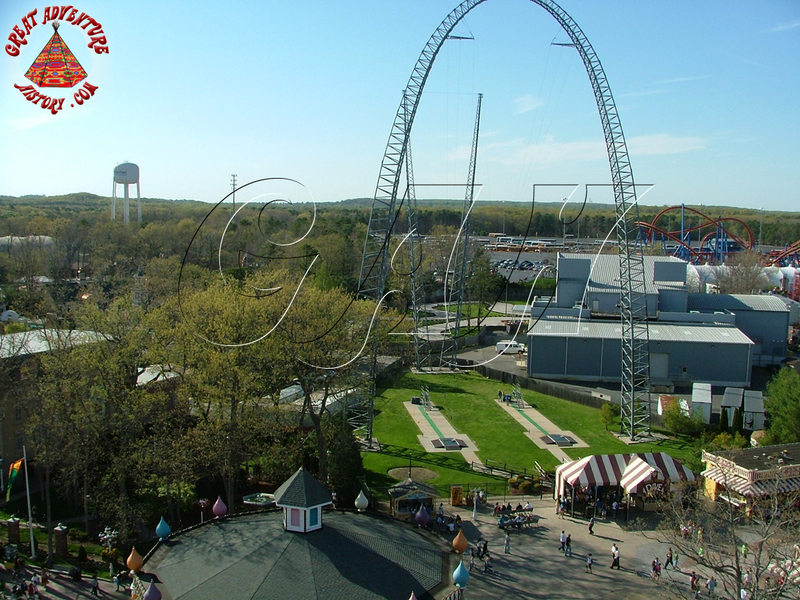 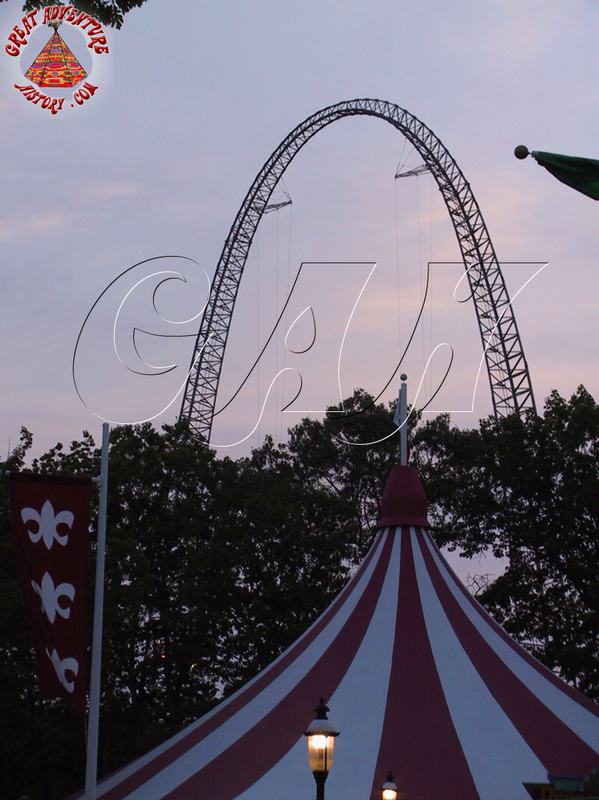 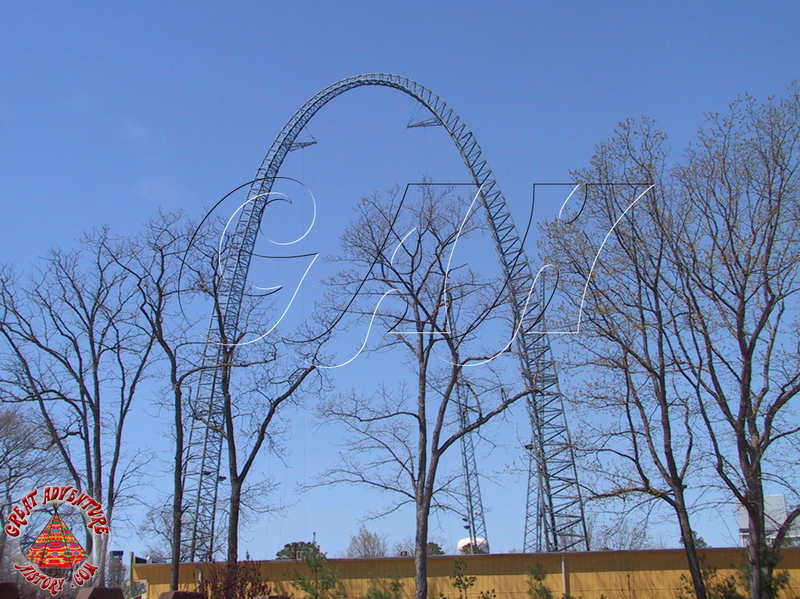 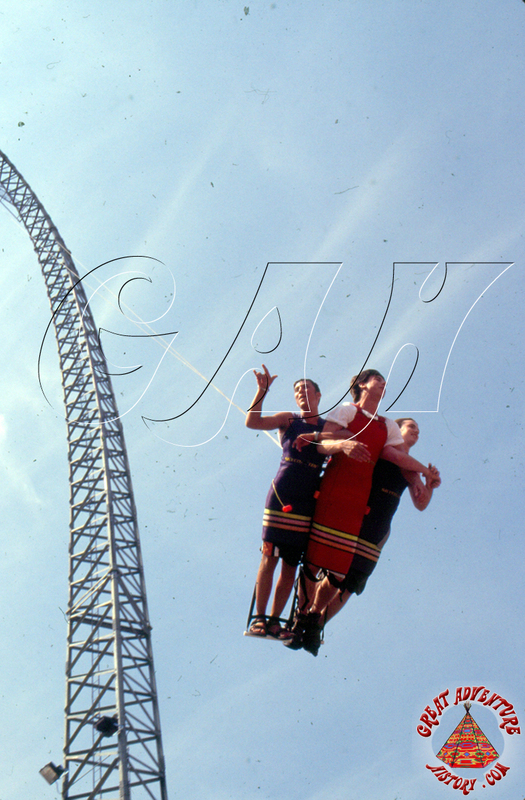 Theme parks always look to add the "next big thing" in thrills, and one of the big new attractions that was developed in the 1990's was the Sky Coaster, a new ride that combined elements of sky diving, hang gliding and bungee jumping into one attraction. Sky Coasters of varying sizes were added to parks around the world, with each park trying to outdo the others with bigger versions. 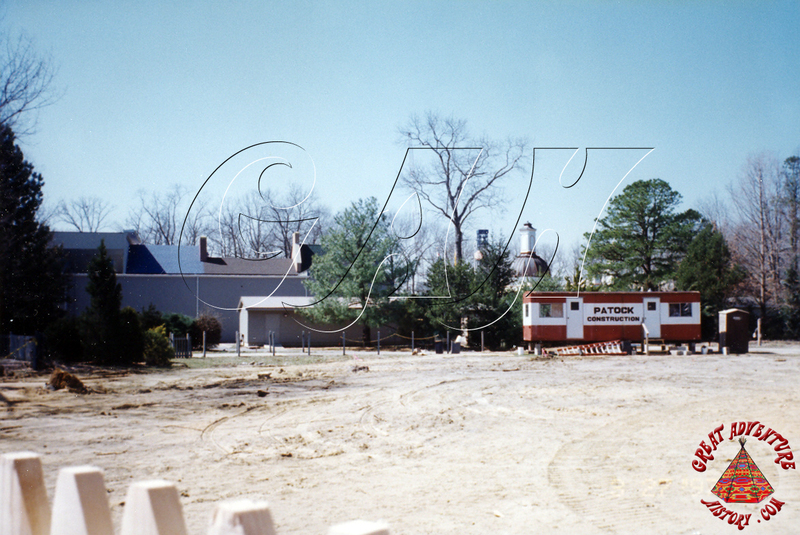 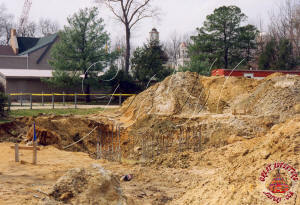 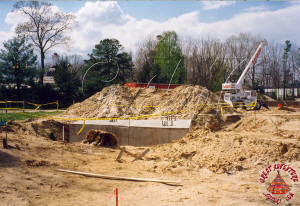 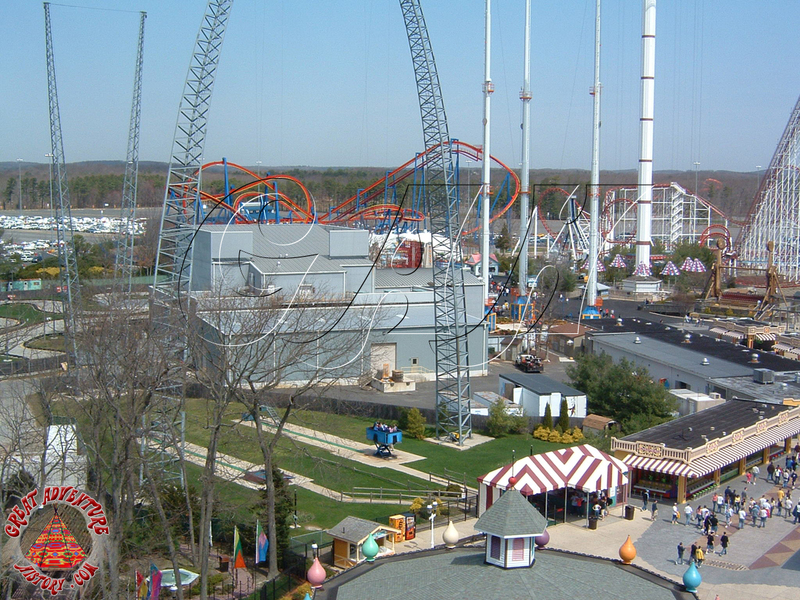 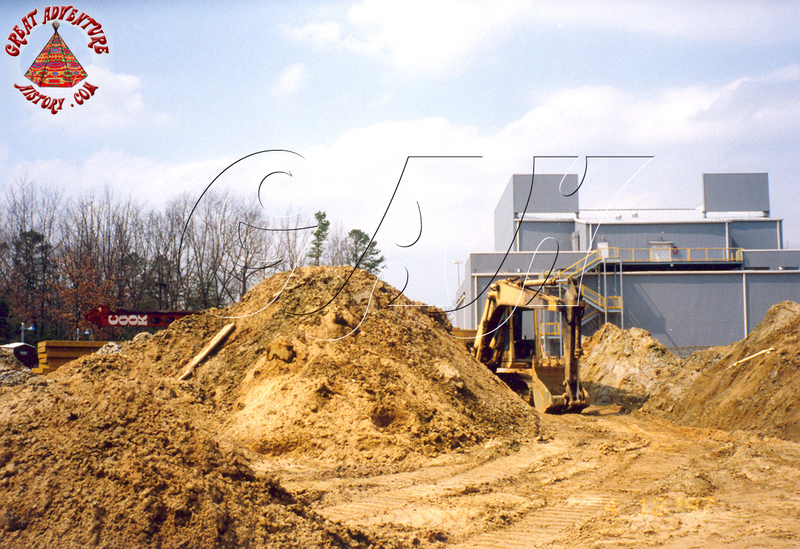 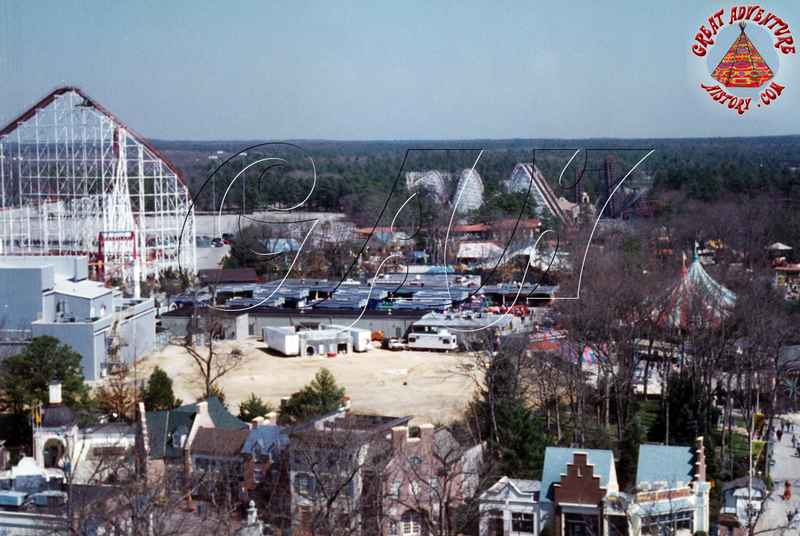 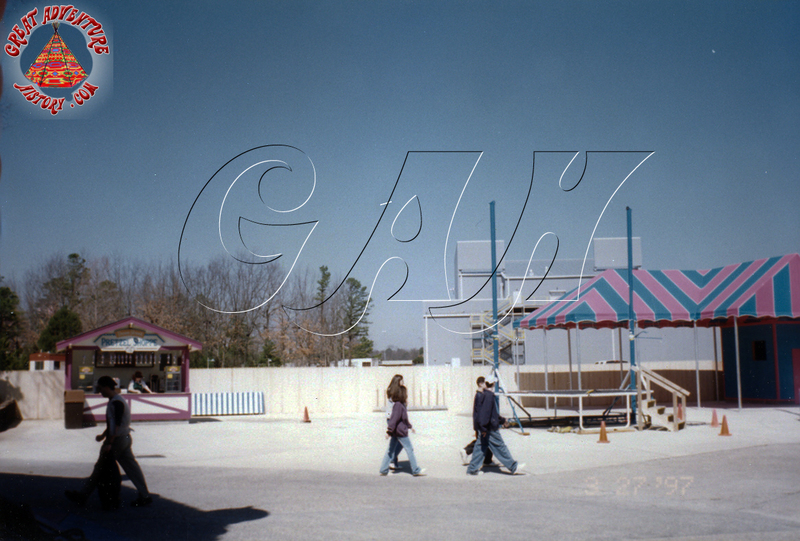 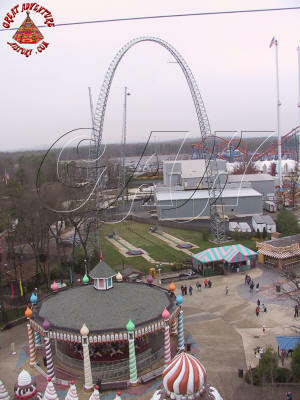 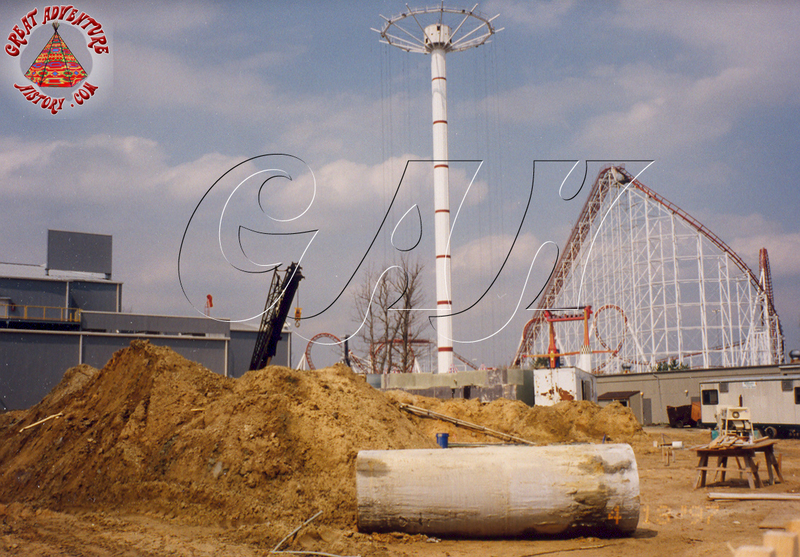 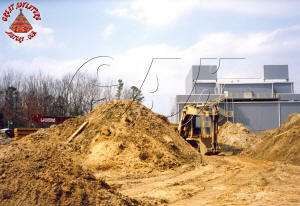 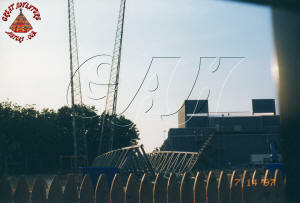 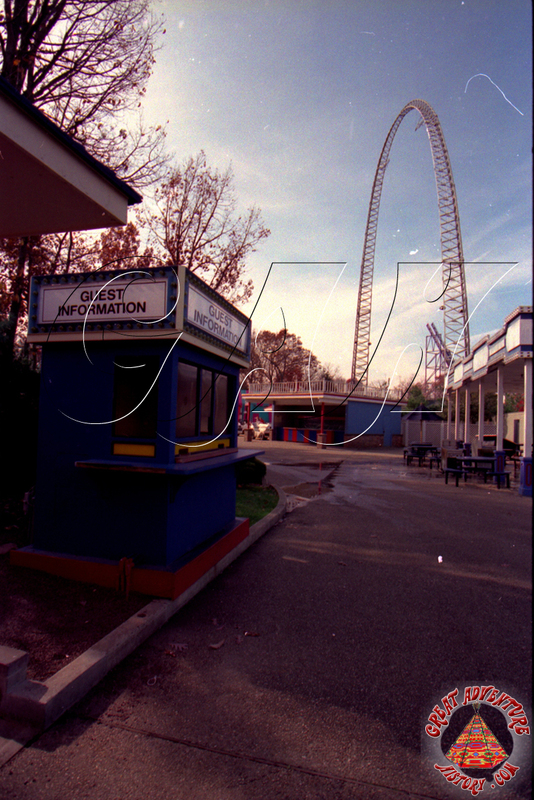 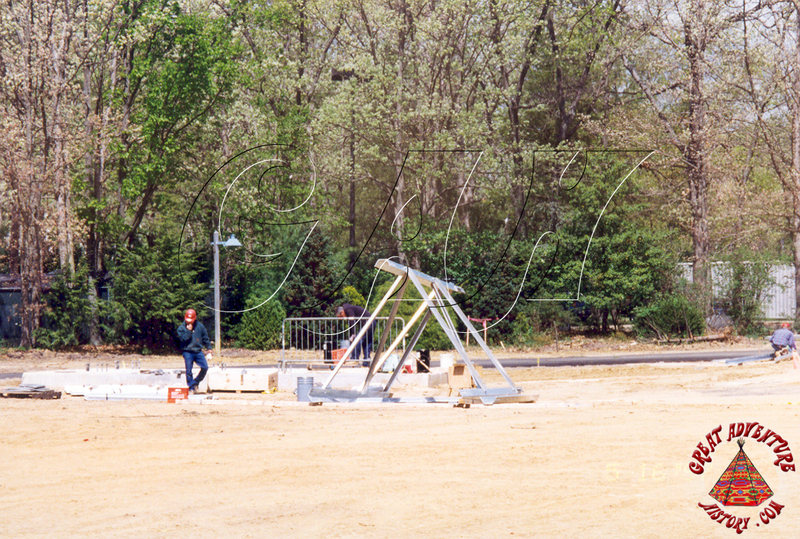 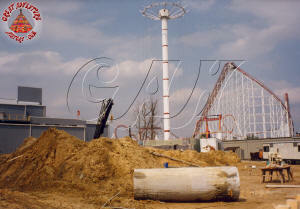 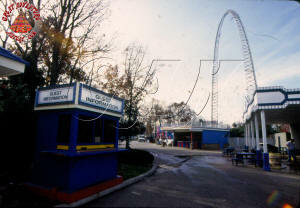 In the spring of 1997, construction began on the former site of the ShockWave roller coaster which was home to the Garden of Marvels before that. 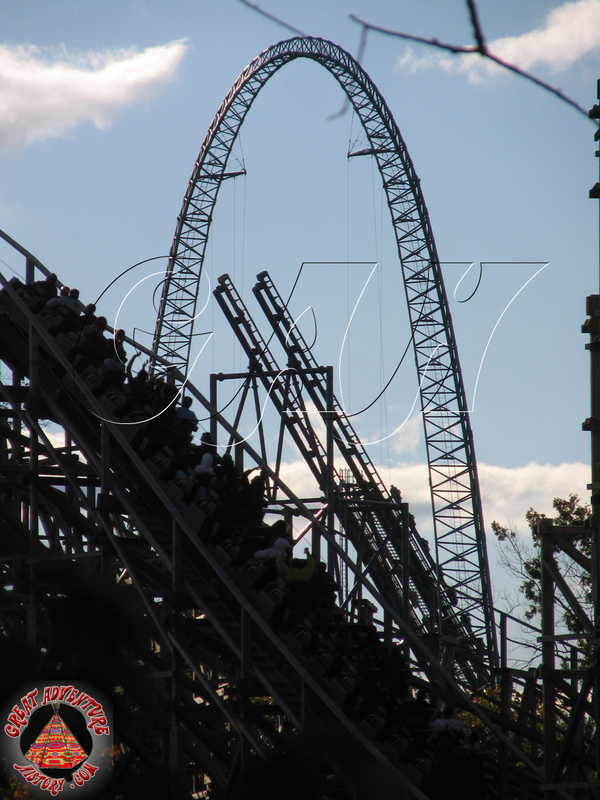 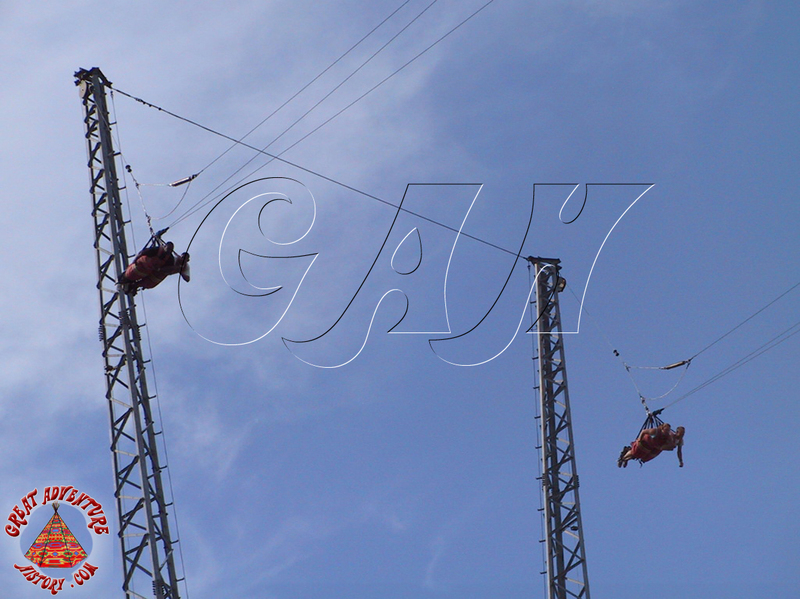 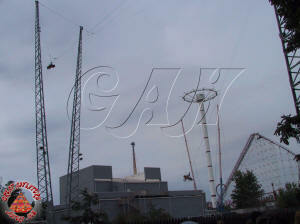 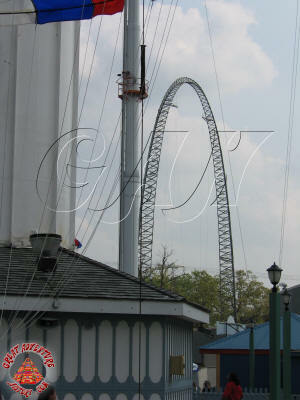 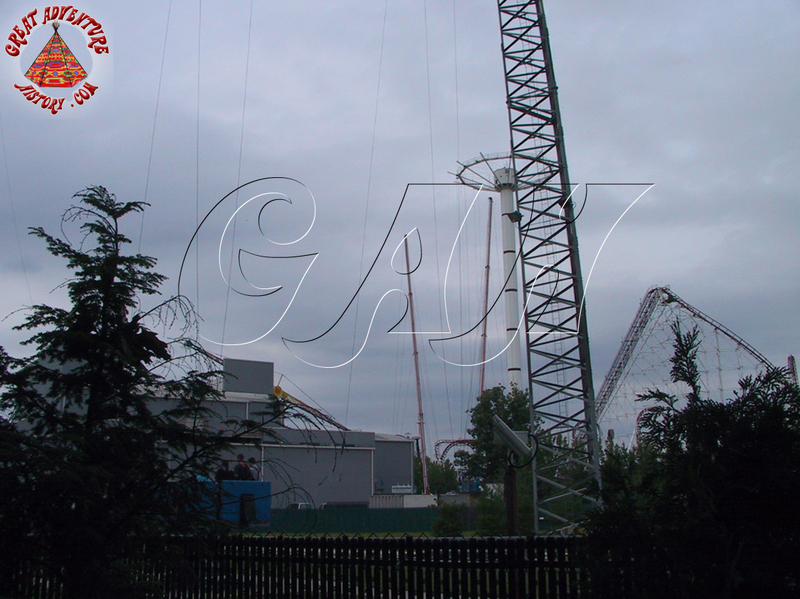 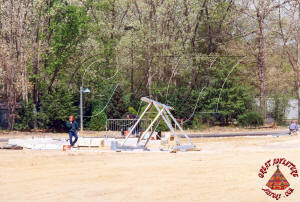 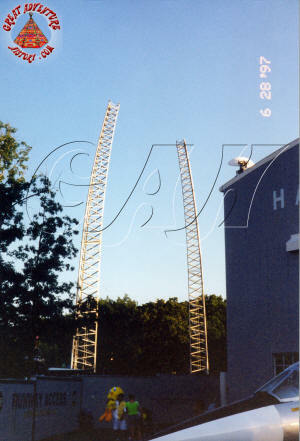 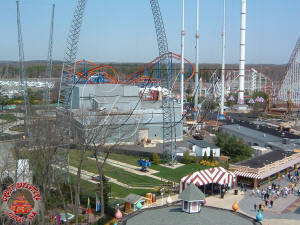 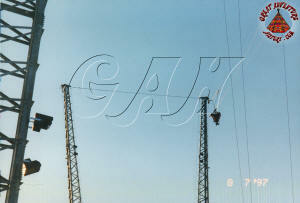 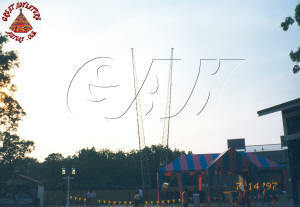 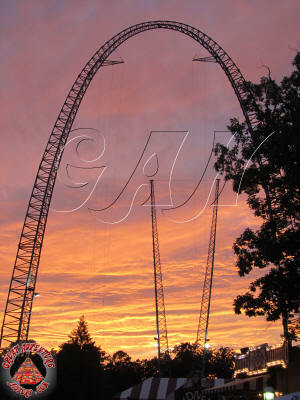 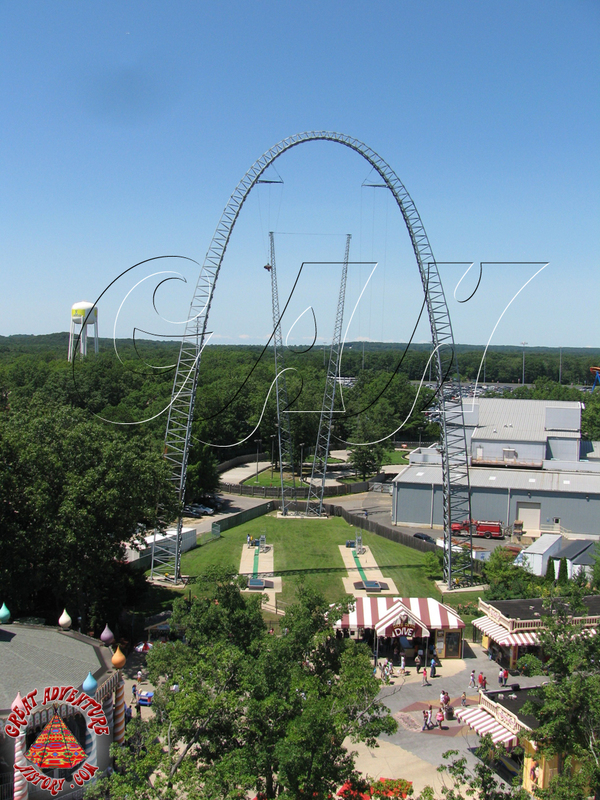 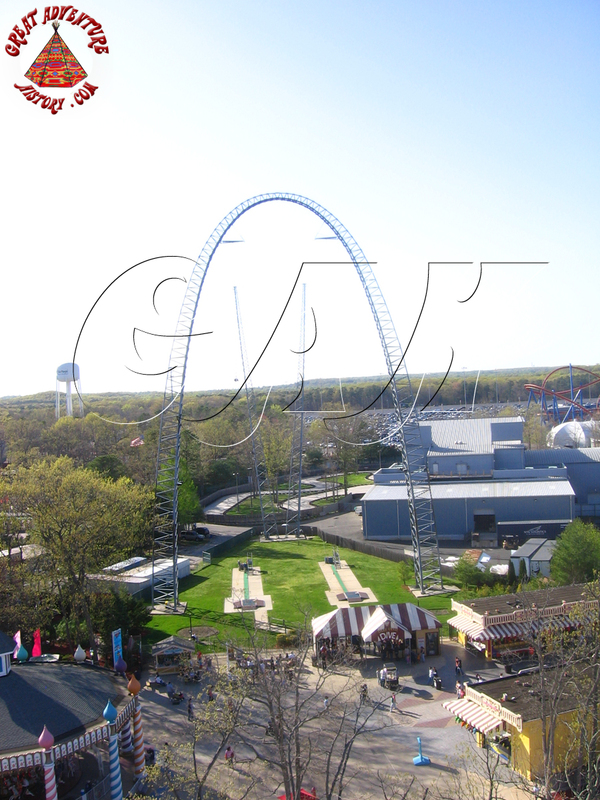 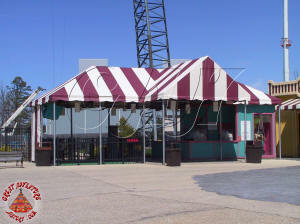 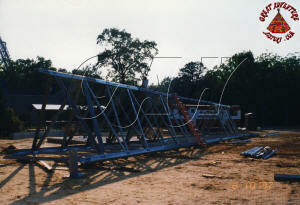 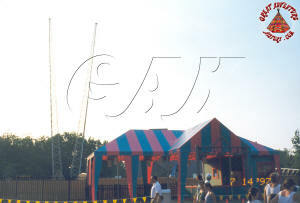 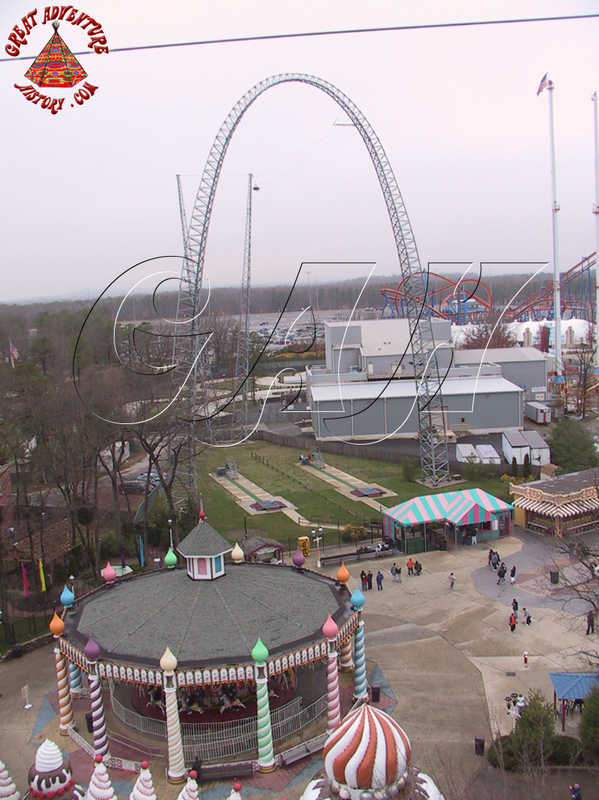 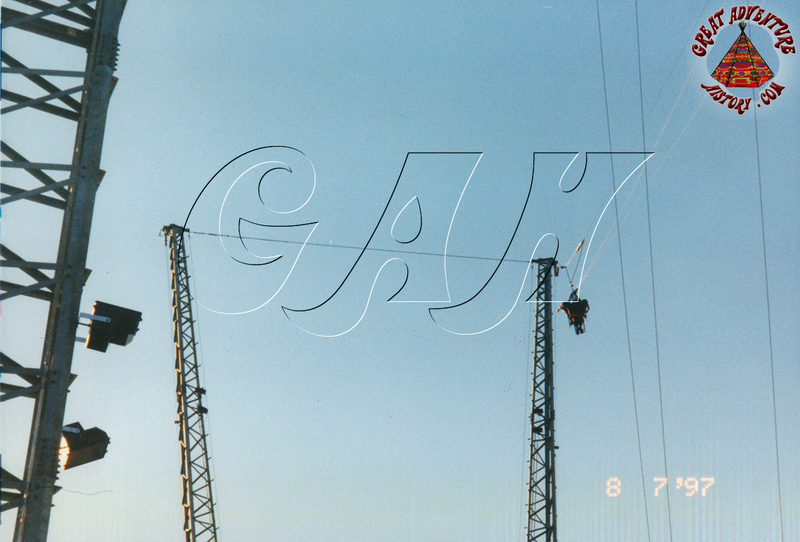 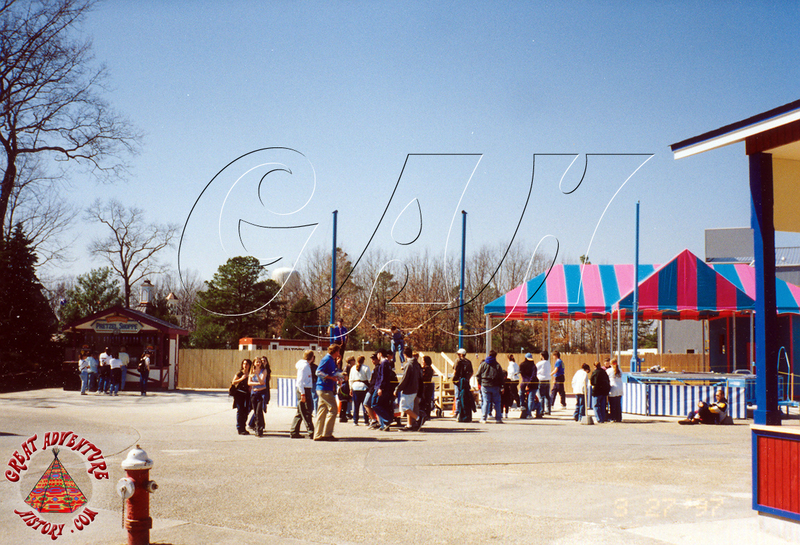 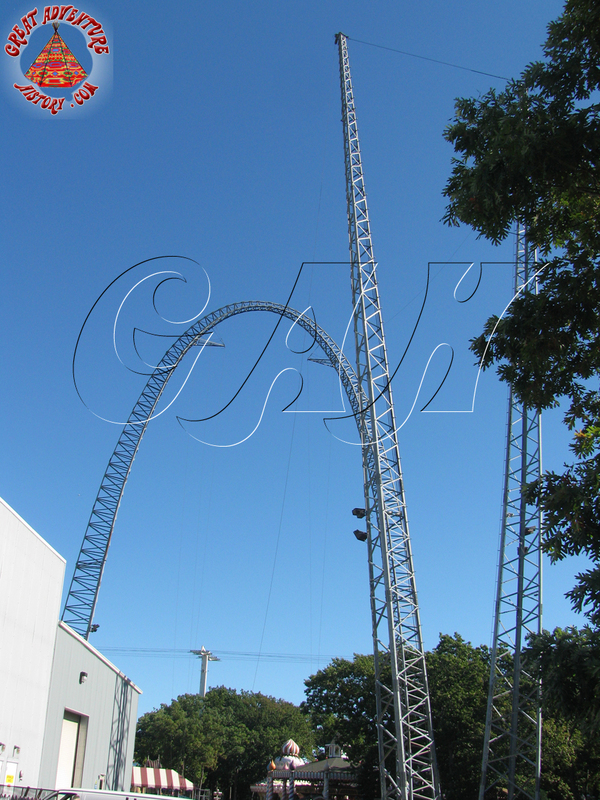 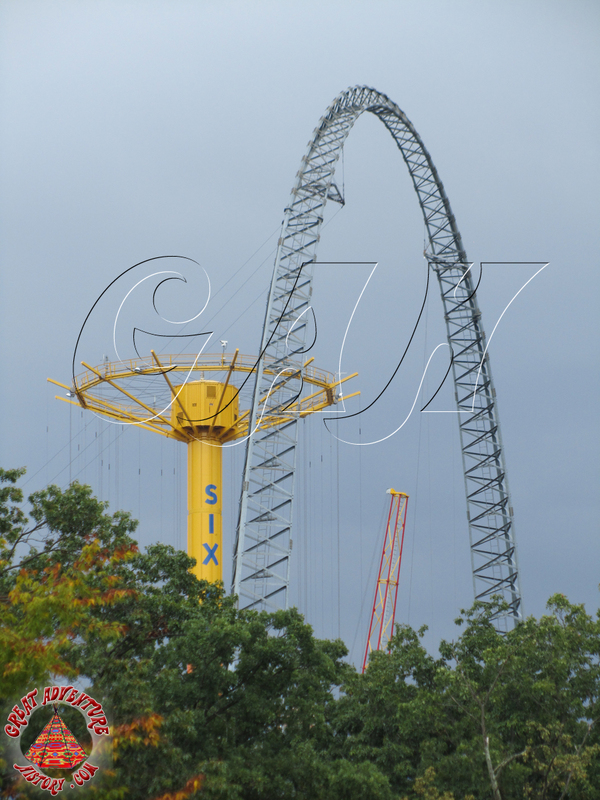 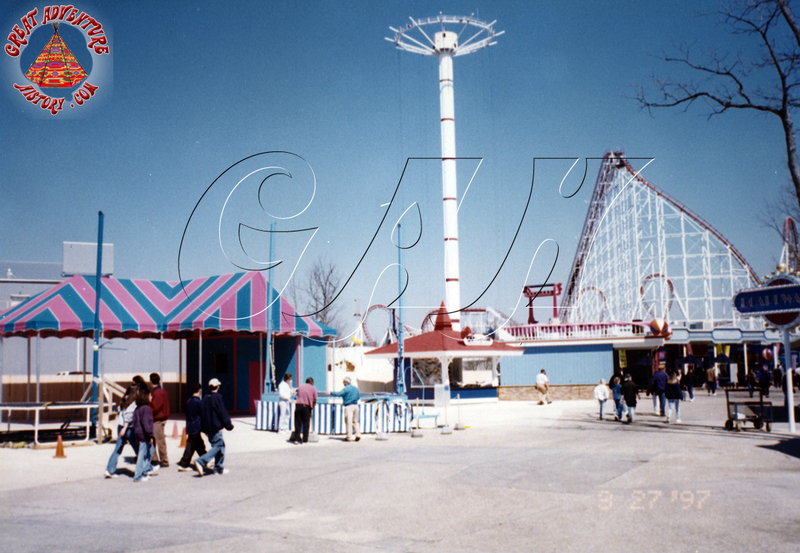 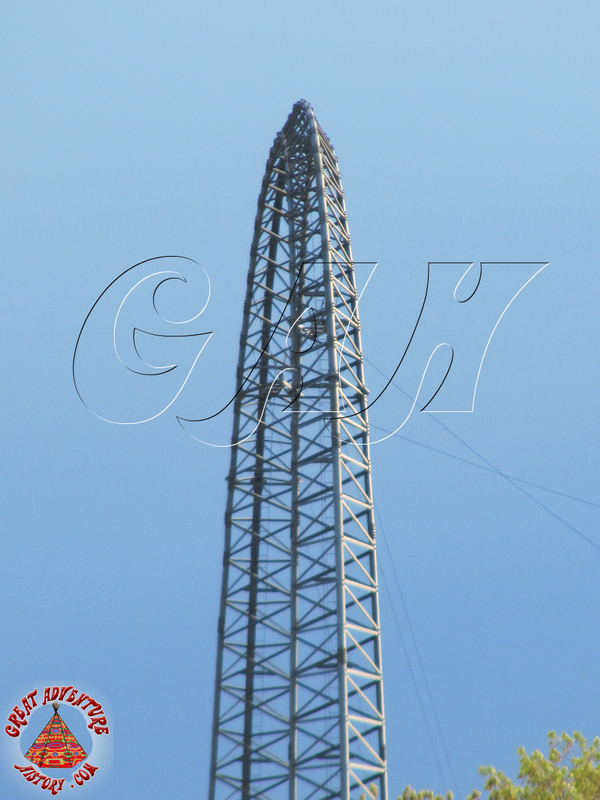 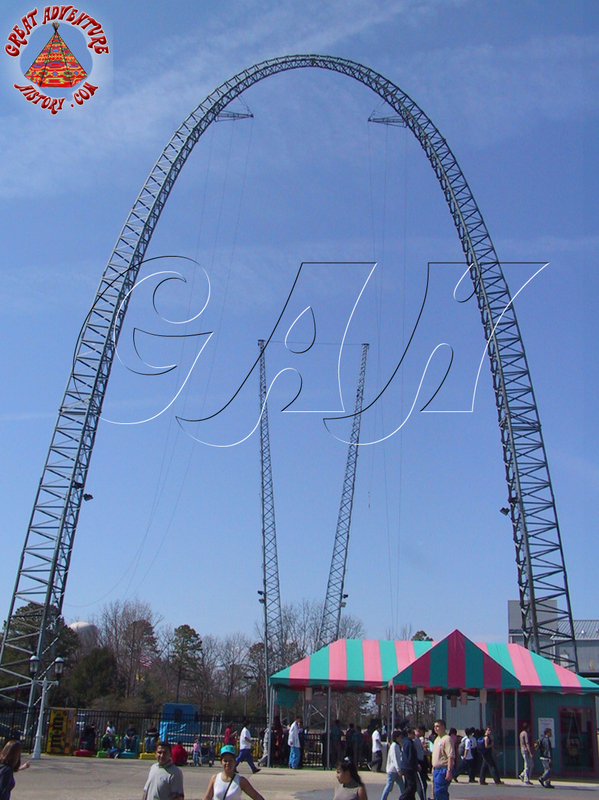 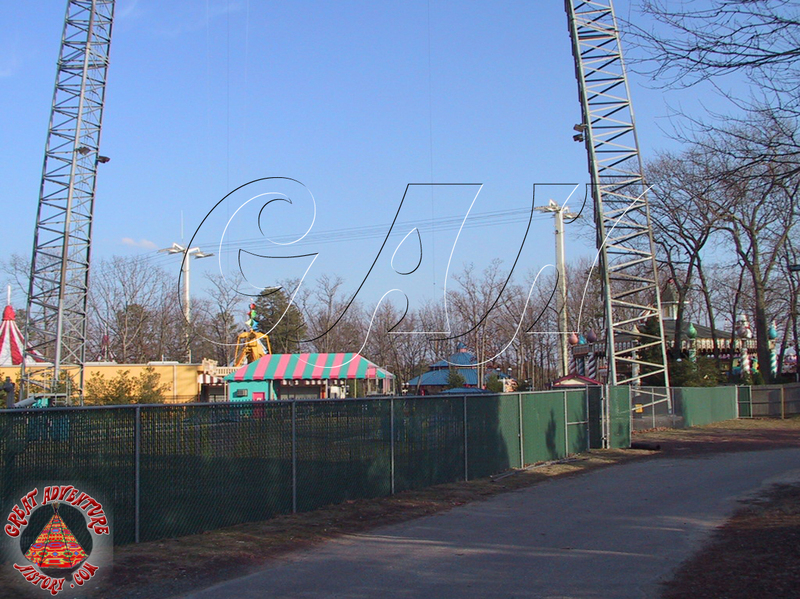 While construction of the Sky Coaster got underway, the canvas-topped ride assembly structure was the first part of the attraction to be erected. 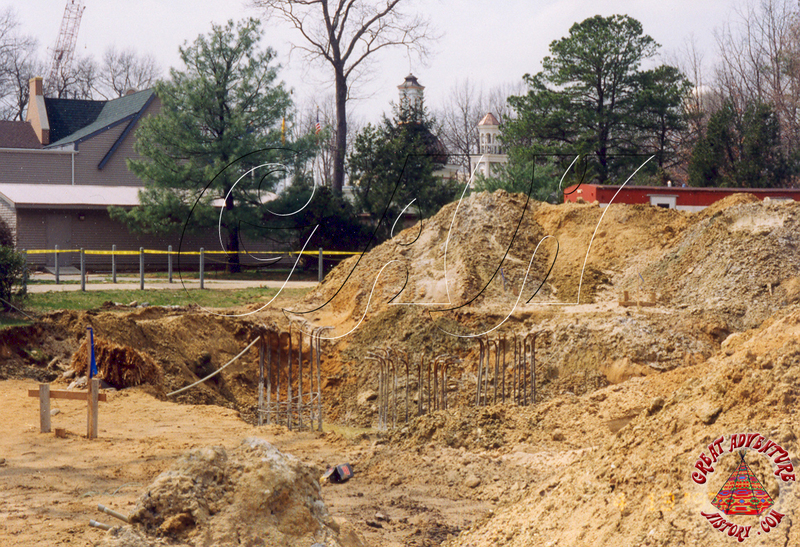 Site preparations for the new attraction took a while between removing the remnants of past attractions below the surface and digging the massive footings for the new Sky Coaster structure. 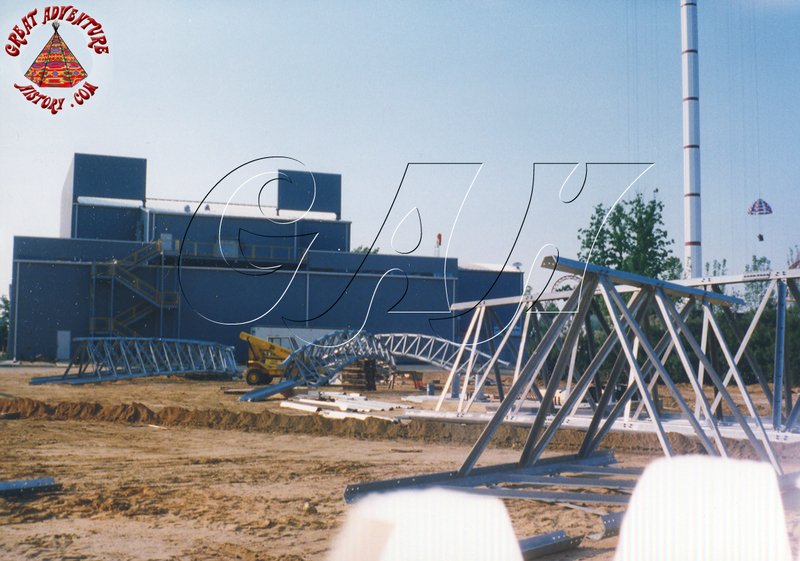 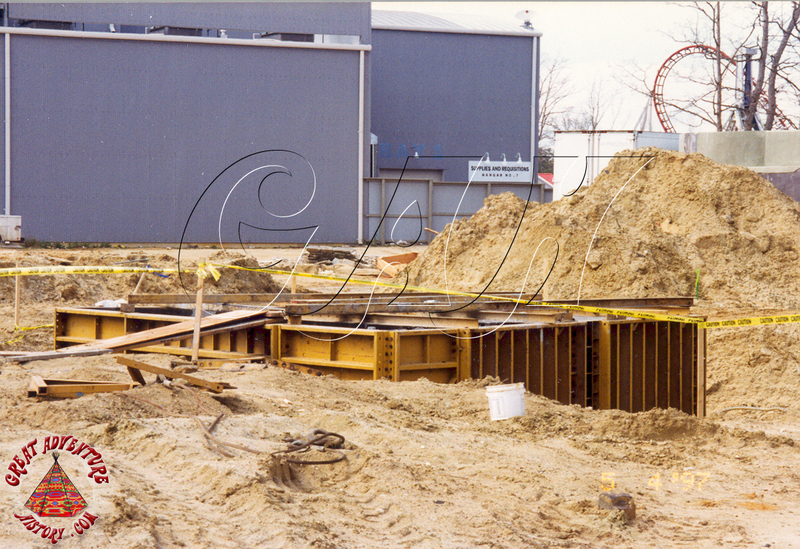 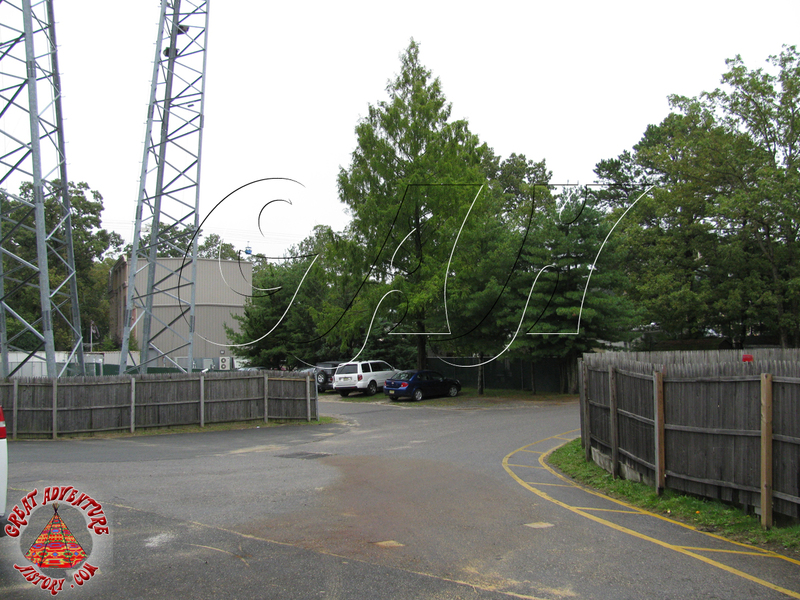 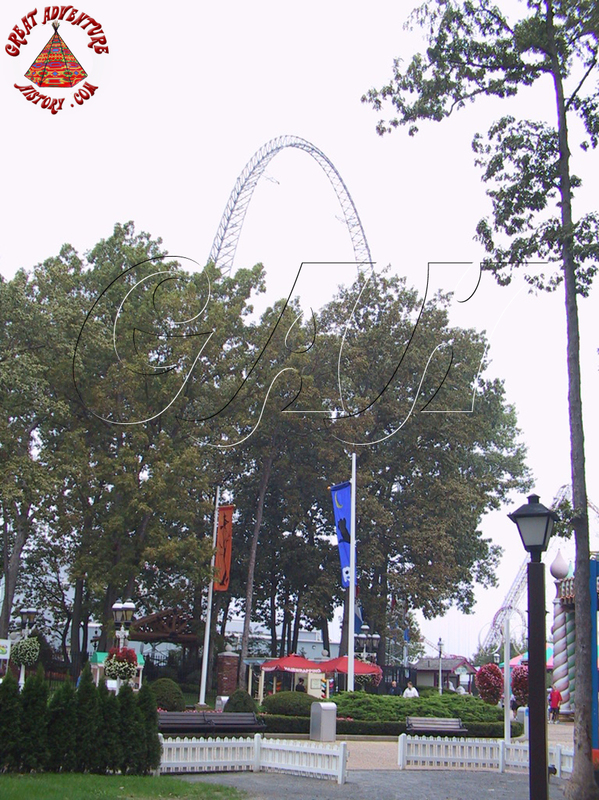 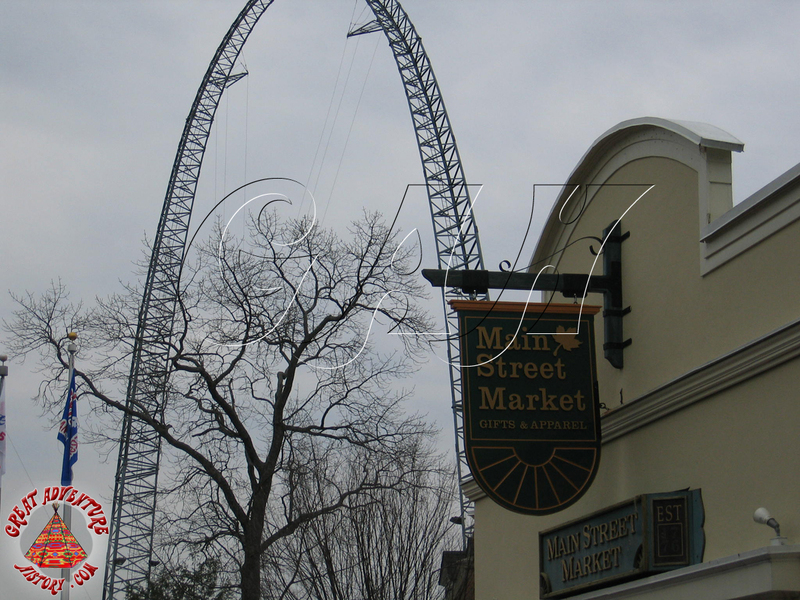 The two huge footers for the sides of the arch were a big part of the project along with the footer for the towers and winches at the back of the attraction. 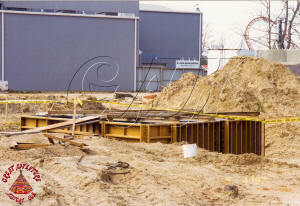 With all the footers in place, the land below was leveled and assembly of the steel structure began. 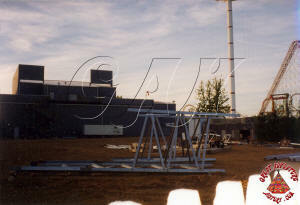 Piece by piece the steel framework was bolted together on the ground before being raised into position. The two towers for the hoisting lines went together first. The two sides of the giant arch were assemble and bolted to the footers with the central connecting section being hoisted into place later. 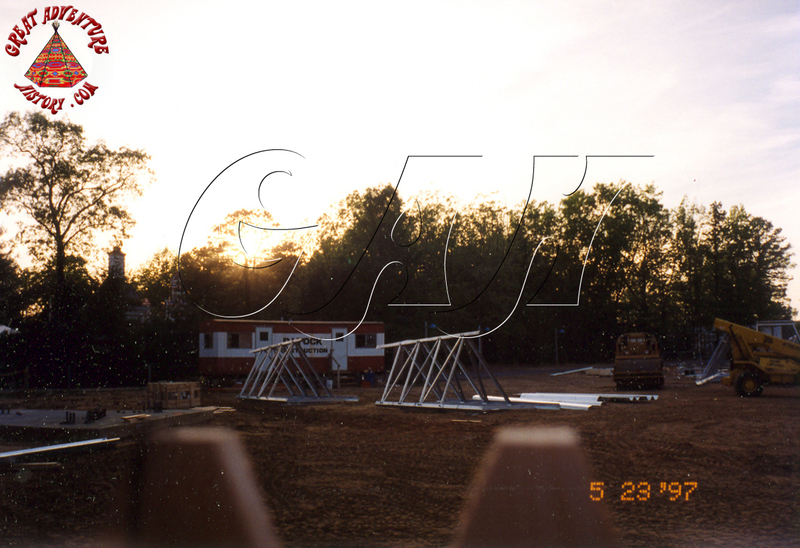 While it appeared construction was nearly complete at the end of June, oddly, in July the arch structure was taken down and reassembled on the ground. 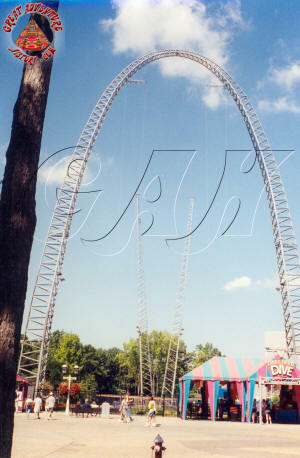 The platforms on the ground along with the walkways were all complete and ready to go, though the arch had to be rebuilt around them. 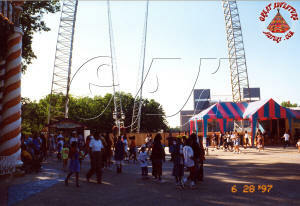 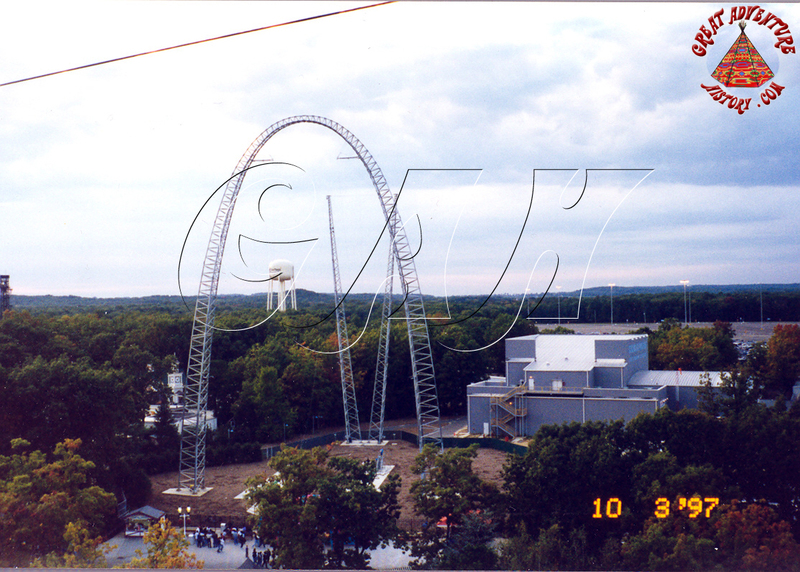 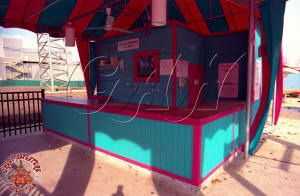 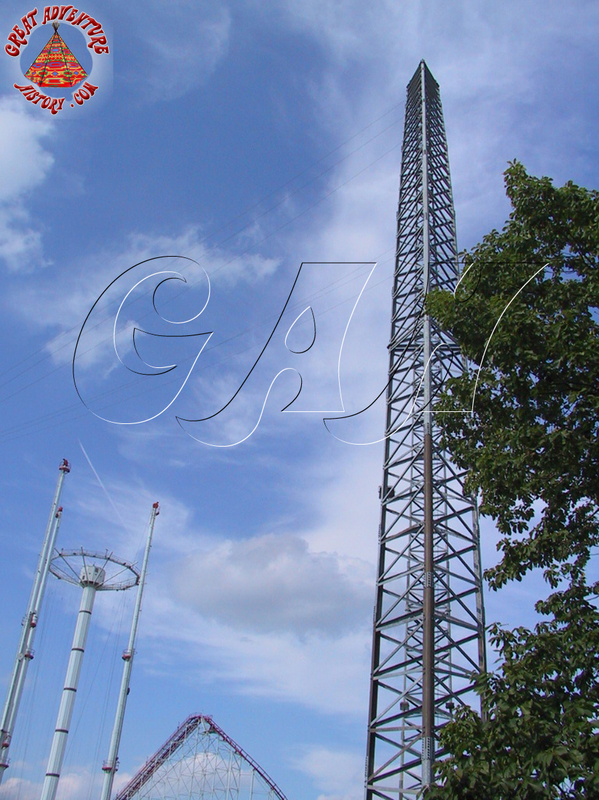 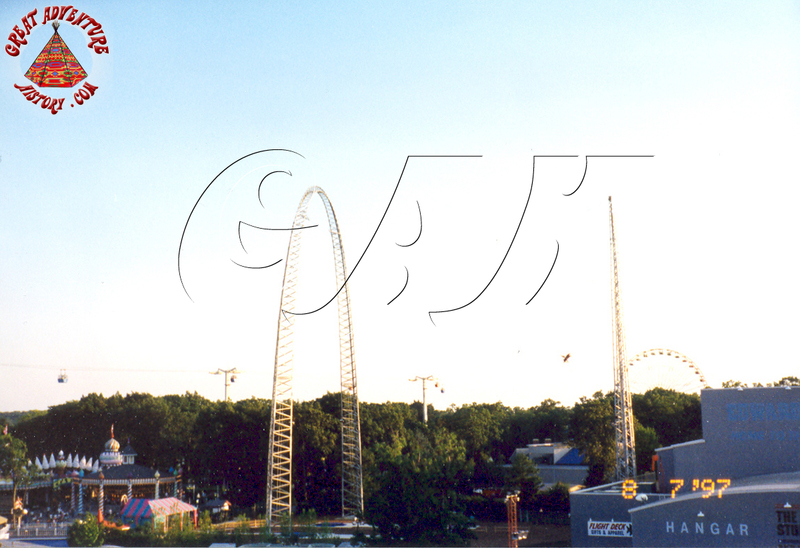 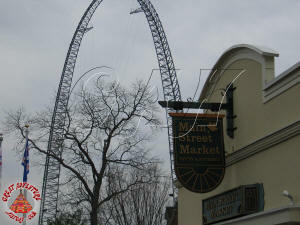 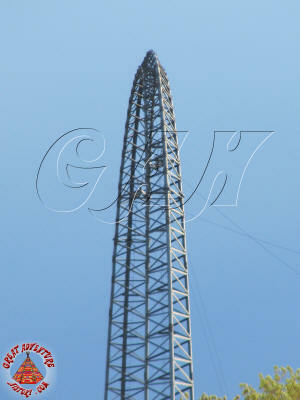 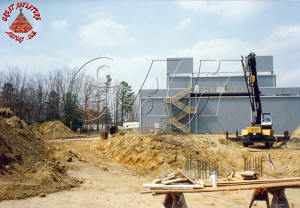 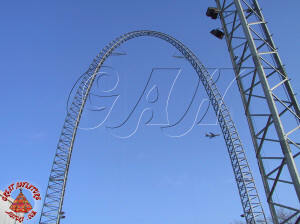 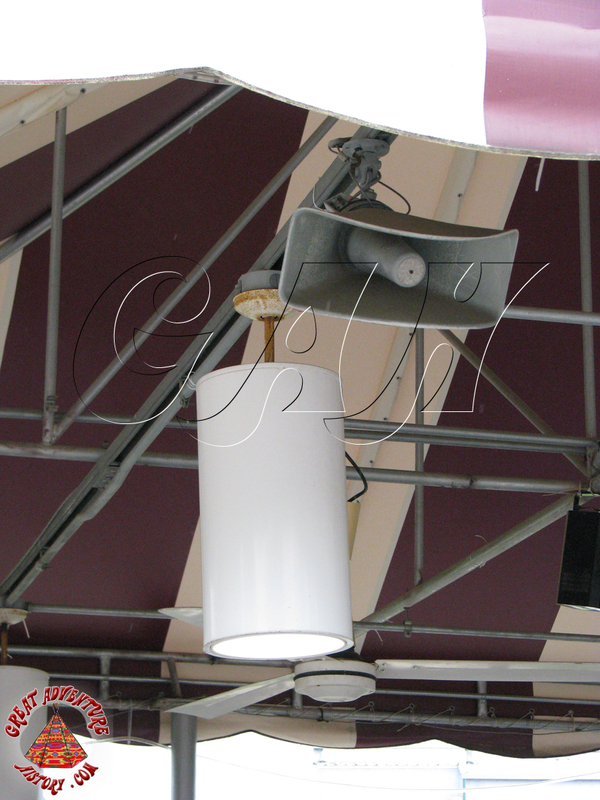 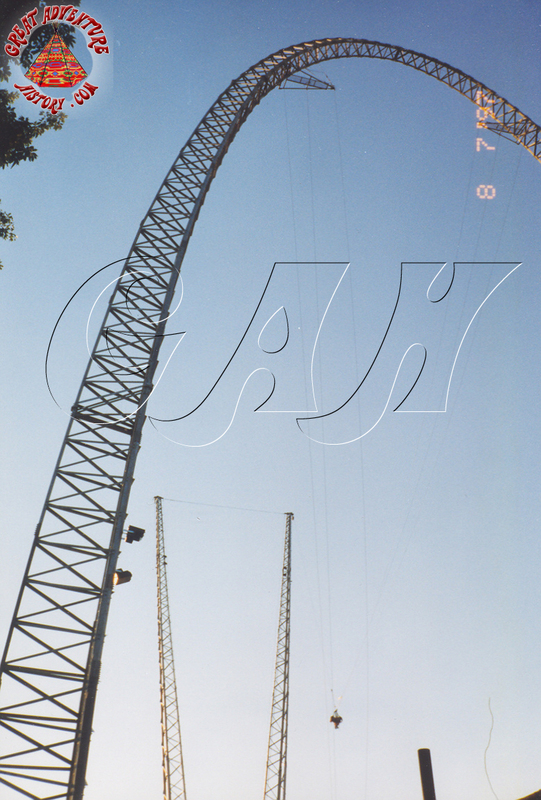 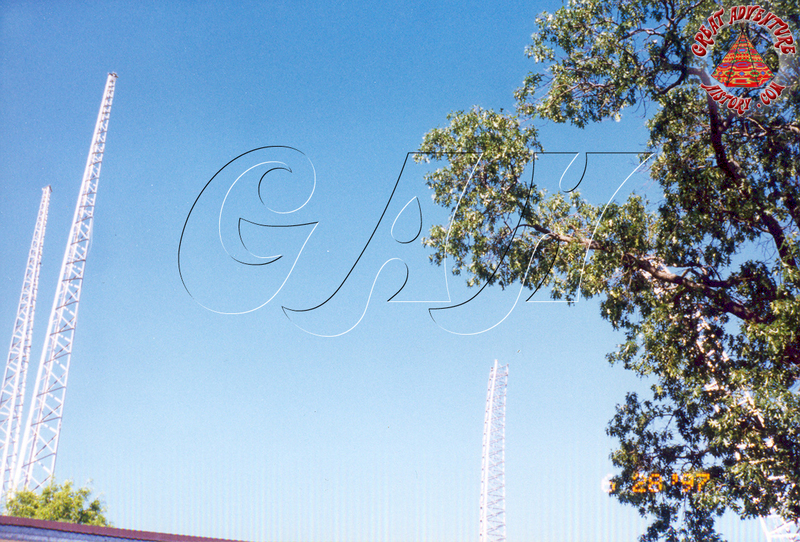 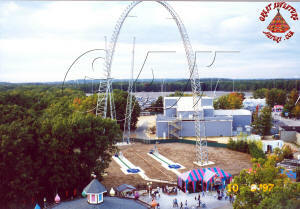 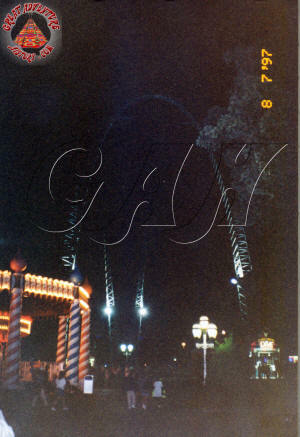 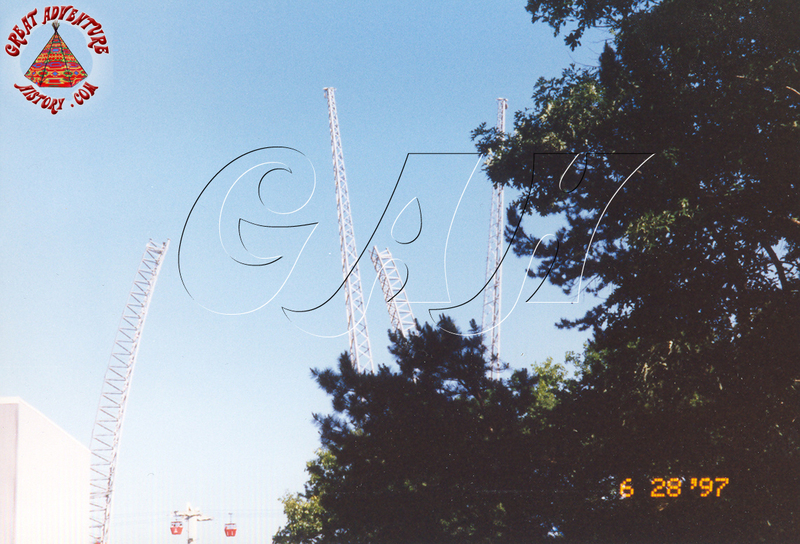 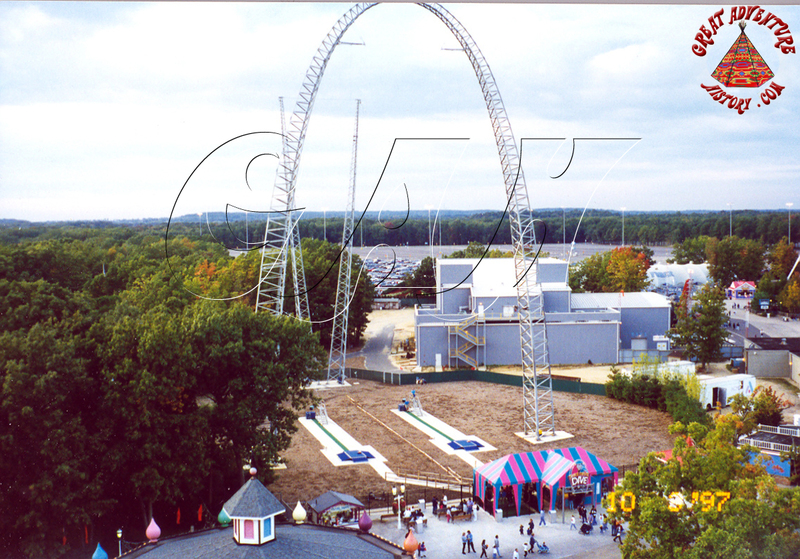 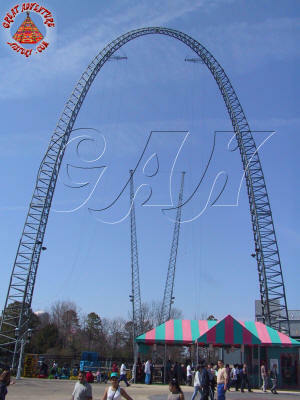 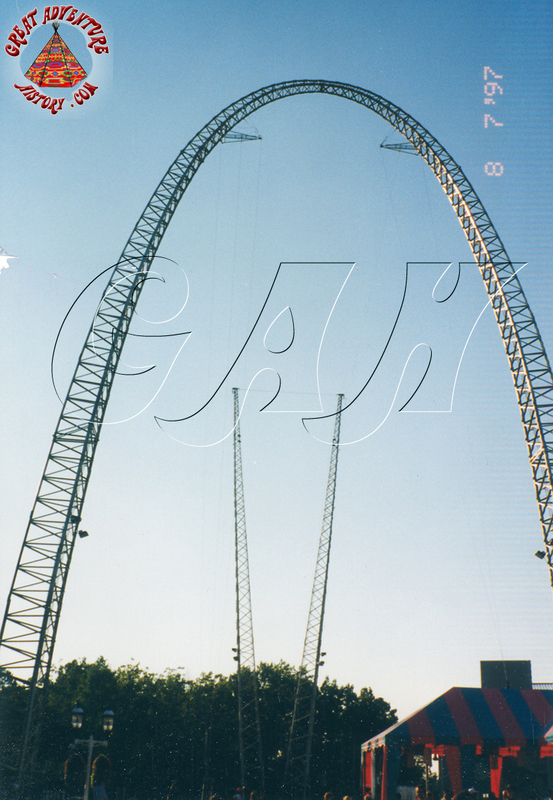 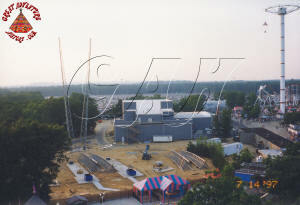 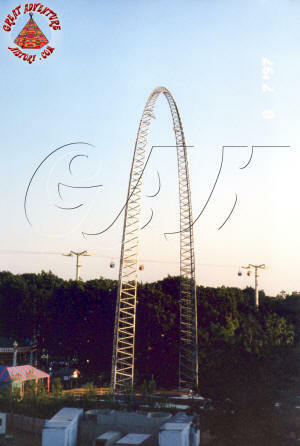 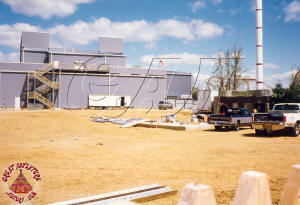 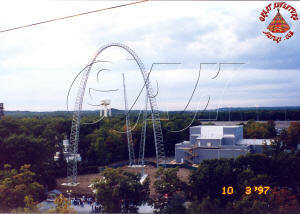 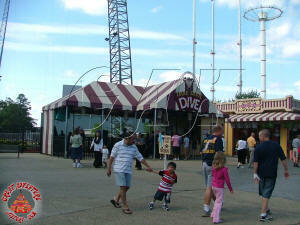 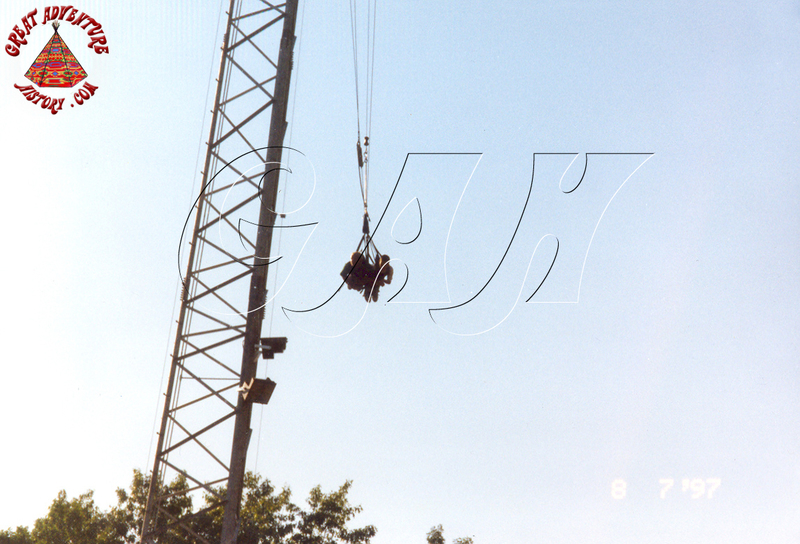 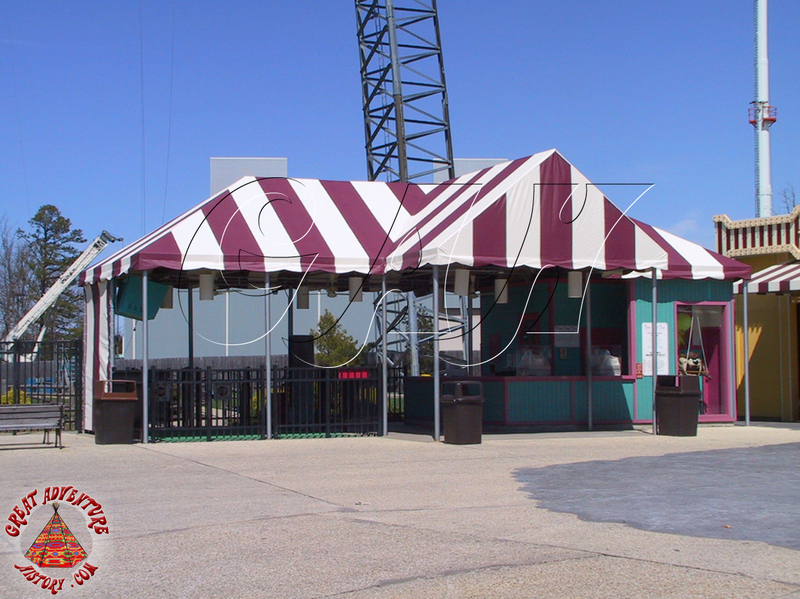 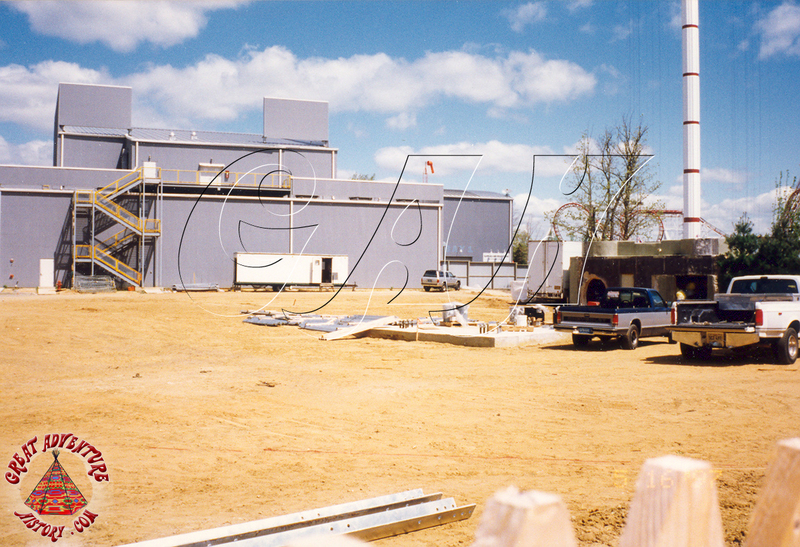 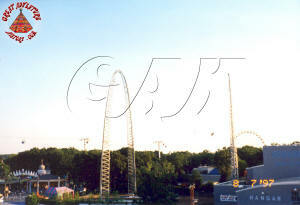 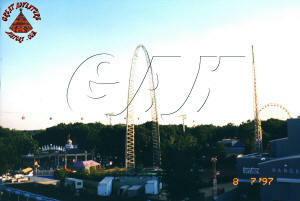 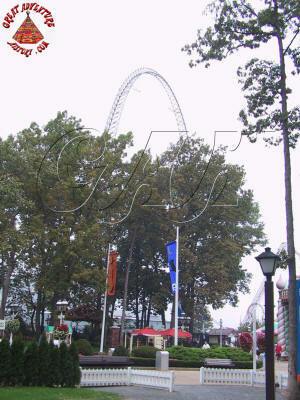 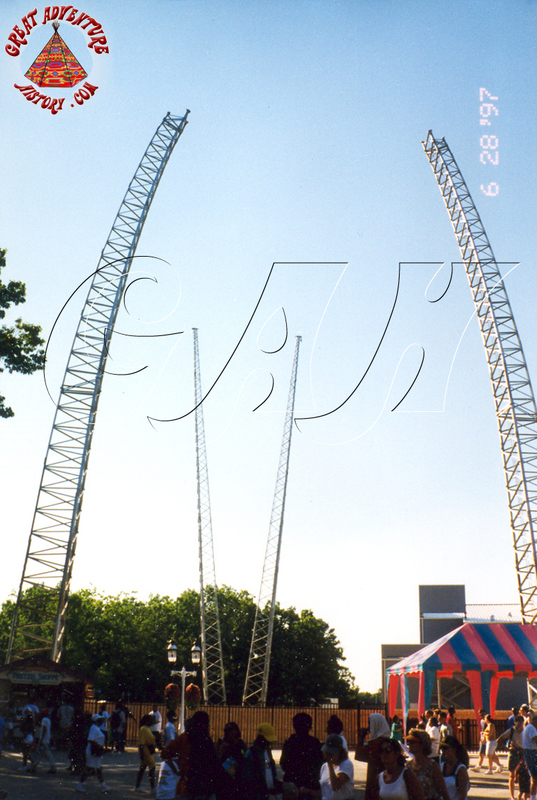 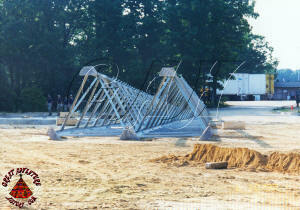 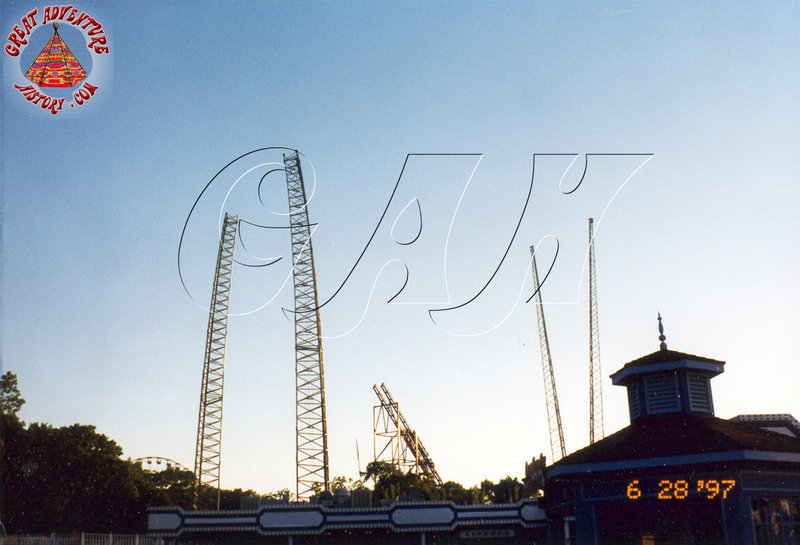 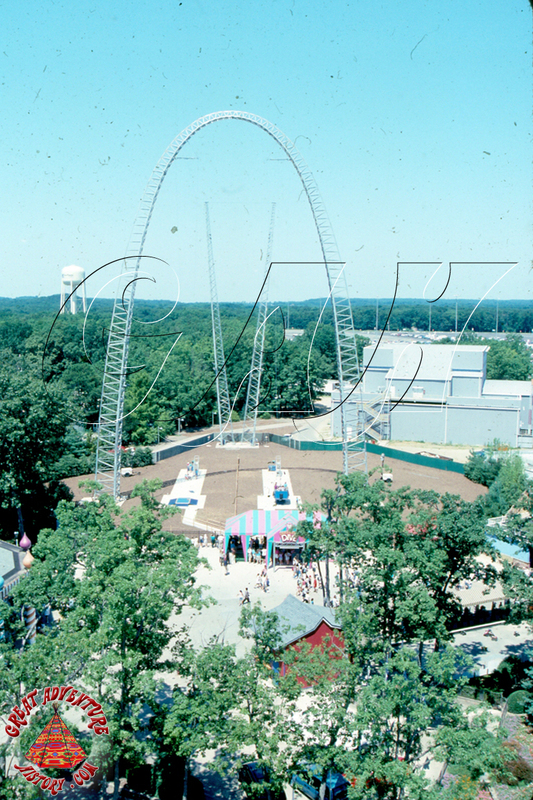 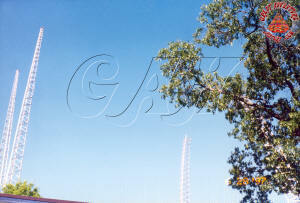 Finally in August of 1997, the ride structure was completed and testing began. 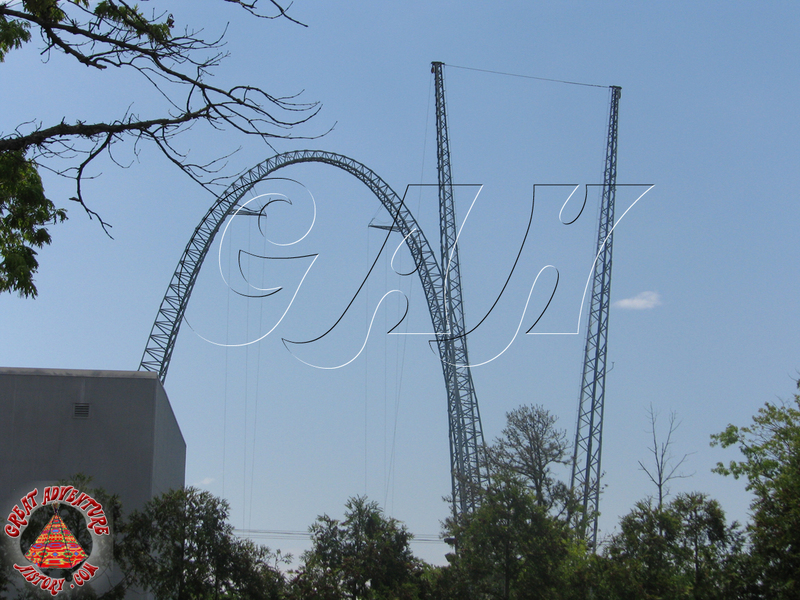 The massive new ride was one of the largest Sky Coasters in the world, and was finally ready to make its debut to park guests. Like many new thrill rides, the Dare Devil Dive had limited capacity so it was offered as an upcharge attraction, limiting the number of guests that could ride in one day. 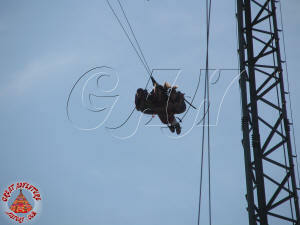 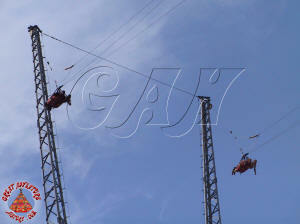 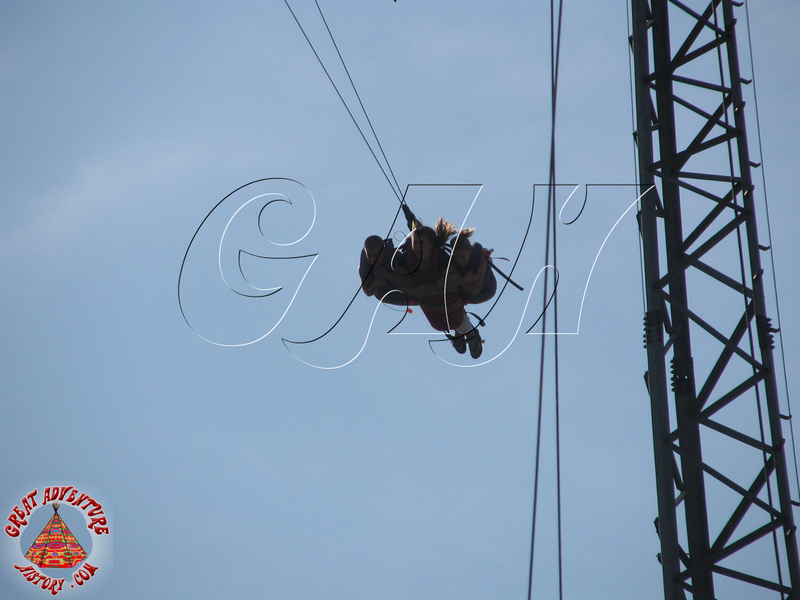 The process of preparing guests to ride was time consuming as well as the actual process of connecting the harnesses to the cables. 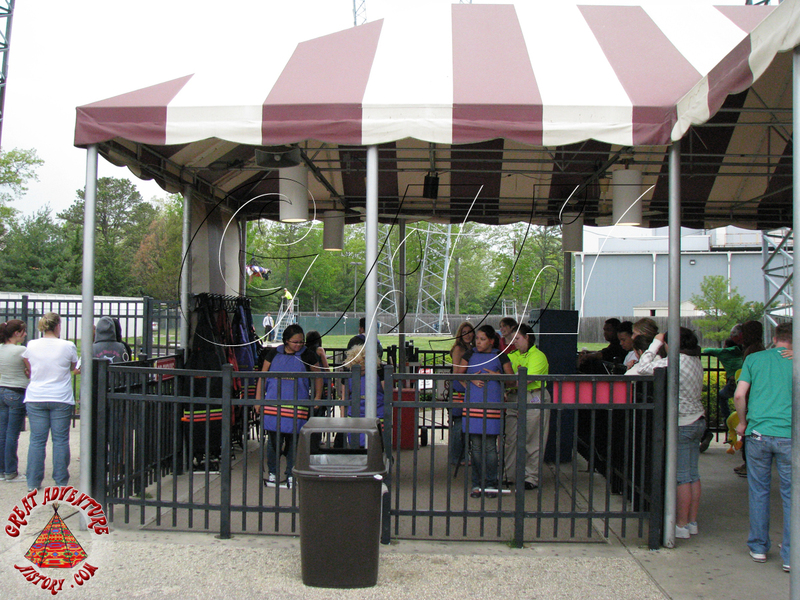 That along with the maximum of three riders per cycle led to long waits, and resulted in the ride crew taking reservations for ride appointments. 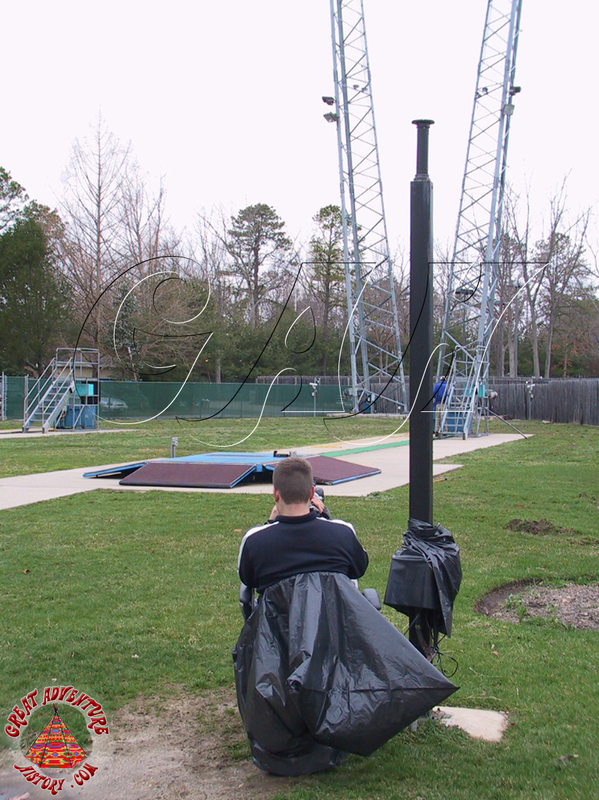 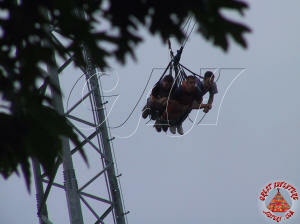 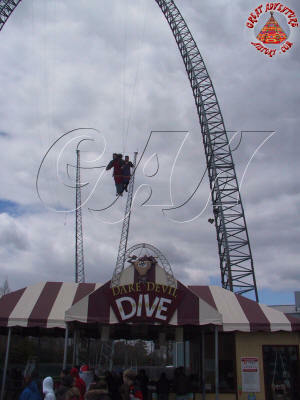 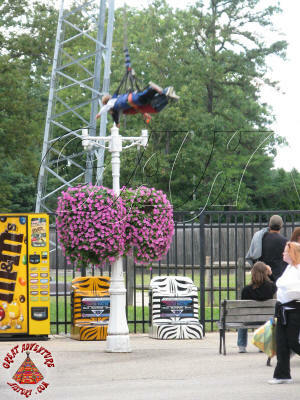 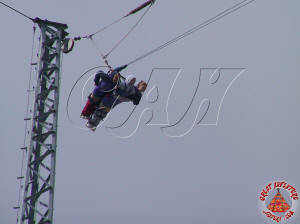 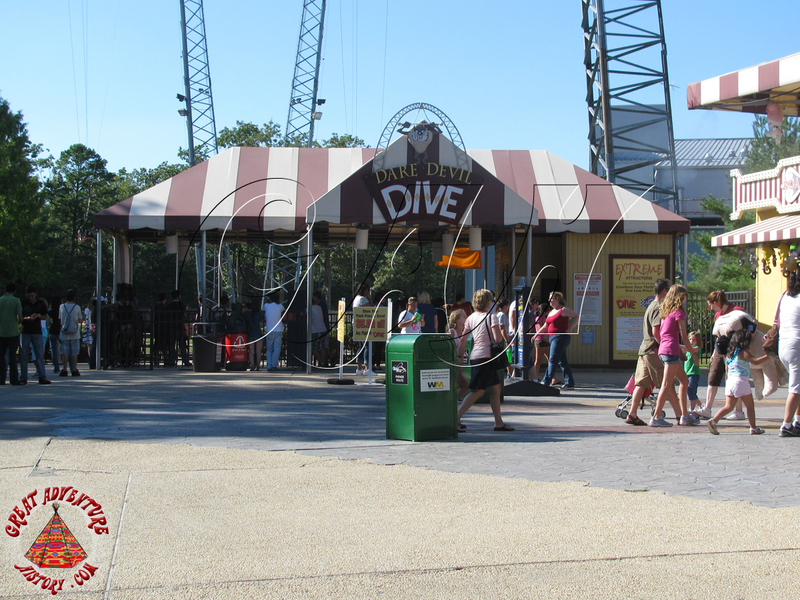 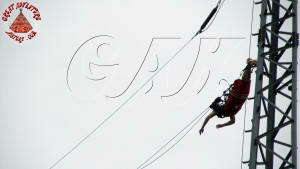 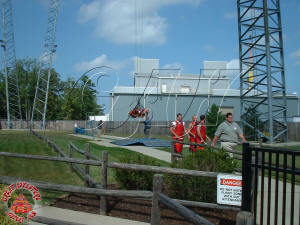 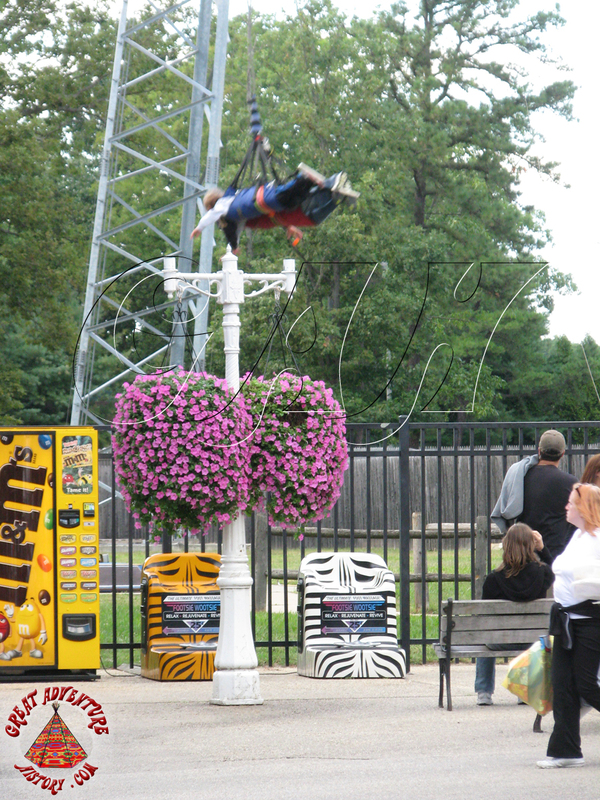 Dare Devil Dive was an immediate success with guests despite the additional cost of riding. 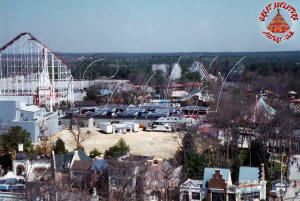 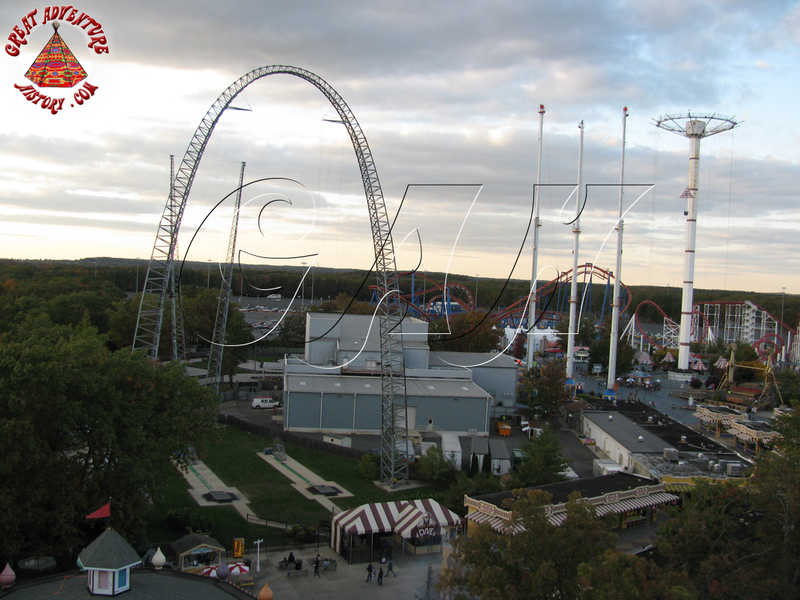 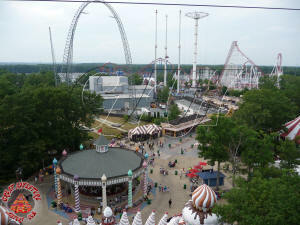 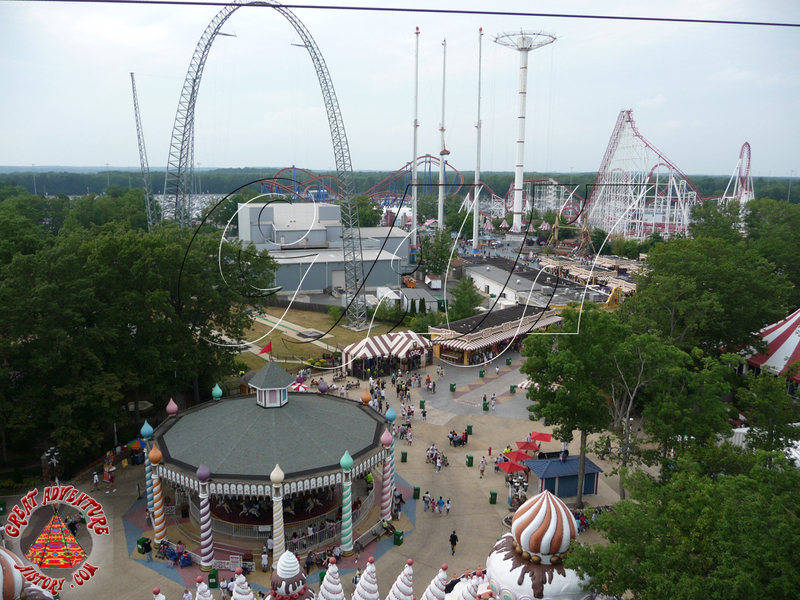 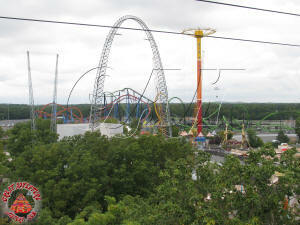 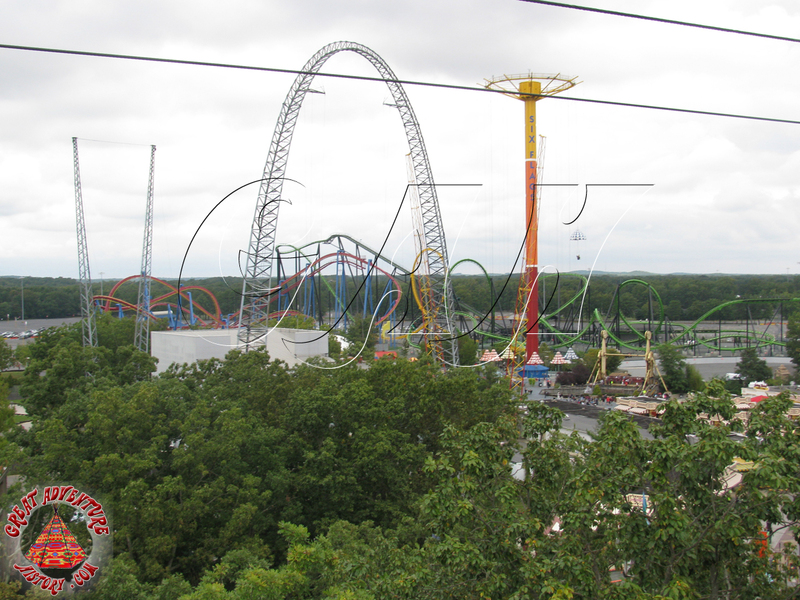 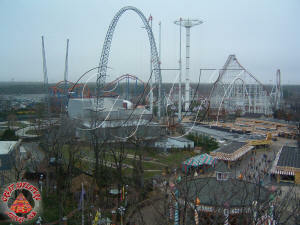 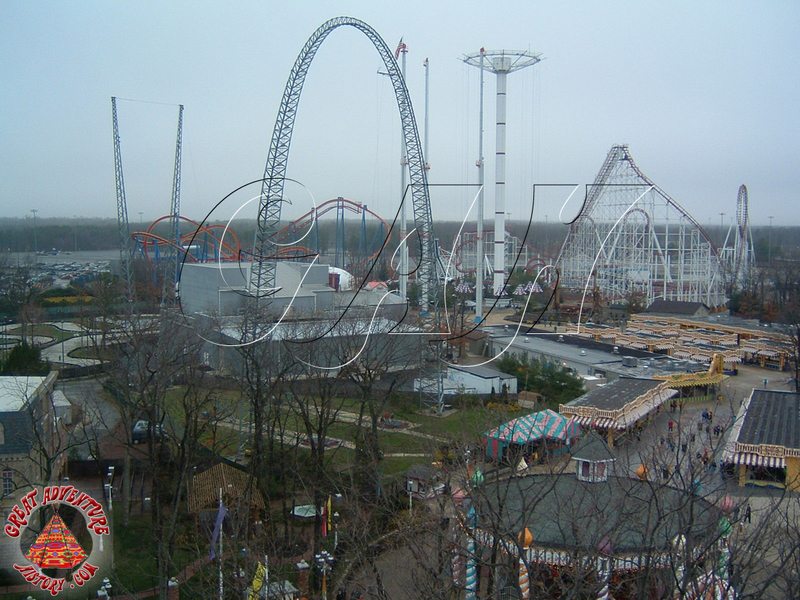 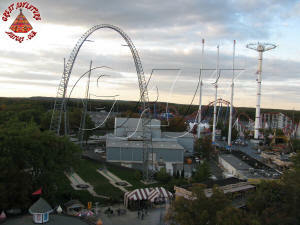 The new ride changed the skyline of the park and its central location meant it was visible from all over. 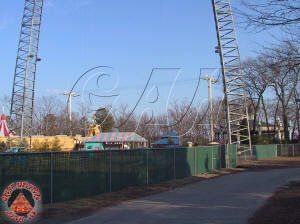 The thrilling nature of the ride along with the swinging arc over the pathways of the Enchanted Forest meant that the once peaceful area around the Carousel was forever changed. 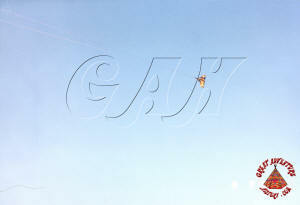 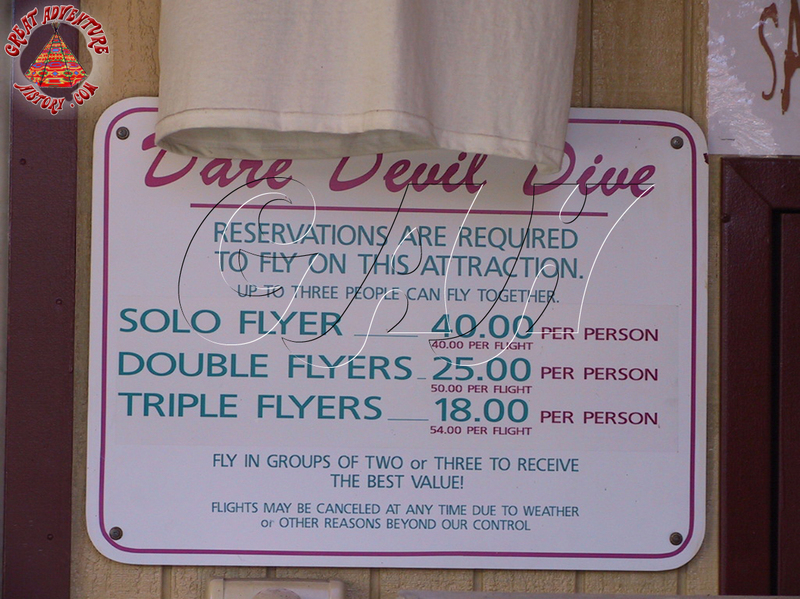 Now the air was filled with screams each time another group of flyers passed over head. 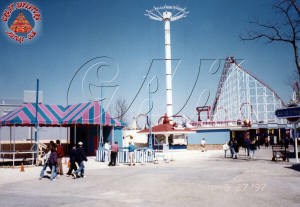 Sometimes the language from the screaming riders detracted from the park's efforts to create a family friendly atmosphere as riders would let out strings of expletives at the top of their lungs. 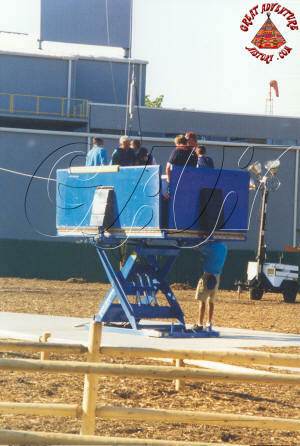 Regardless, the attraction became an instant spectacle with benches stationed in front of the ride for guests to watch the brave flyers. Configuration: Riders can "dive" singly, in doubles or triples. 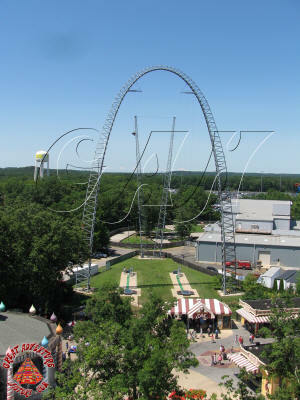 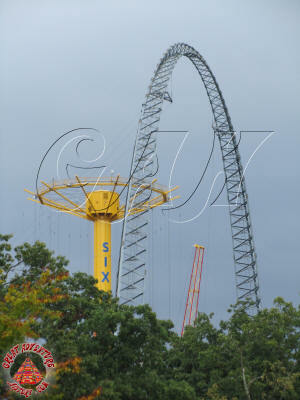 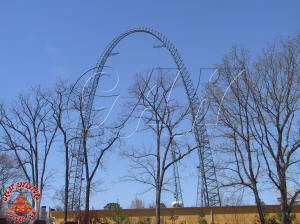 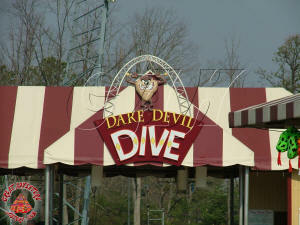 The Dare Devil Dive has been a big money maker for the park. 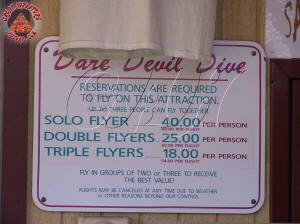 Along with paying for rides, there were also T-shirts available so riders could brag about conquering their fears and taking on the challenge. 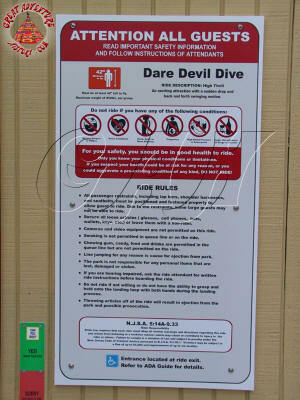 One of the other add-ons offered for Dare Devil Dive was video of the experience. 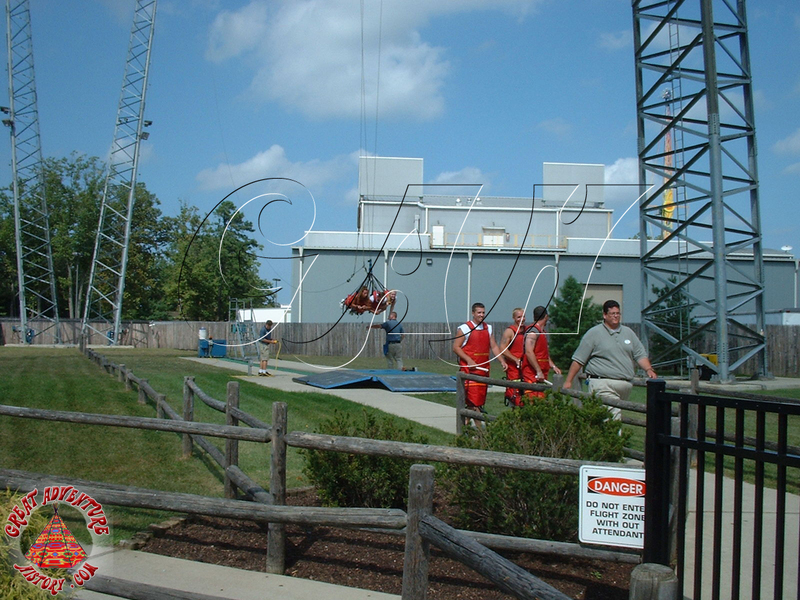 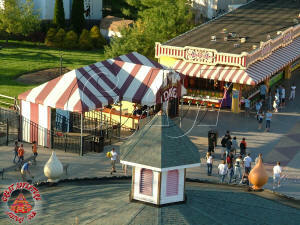 Employees with video cameras were stationed below the ride where they could capture the complete experience as riders were hoisted up and then dropped face first towards the ground. 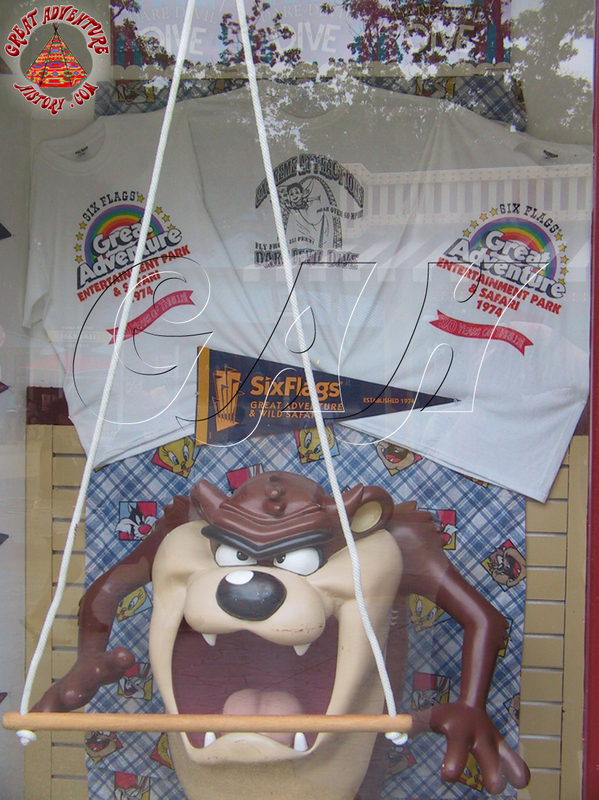 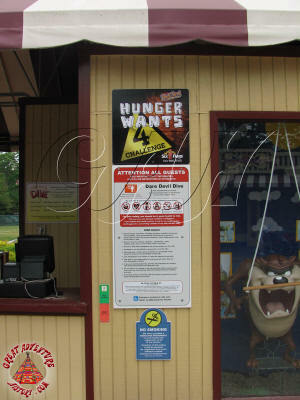 The videos became popular souvenirs and offered participants proof to support their bragging-rights of how brave they were at Great Adventure. 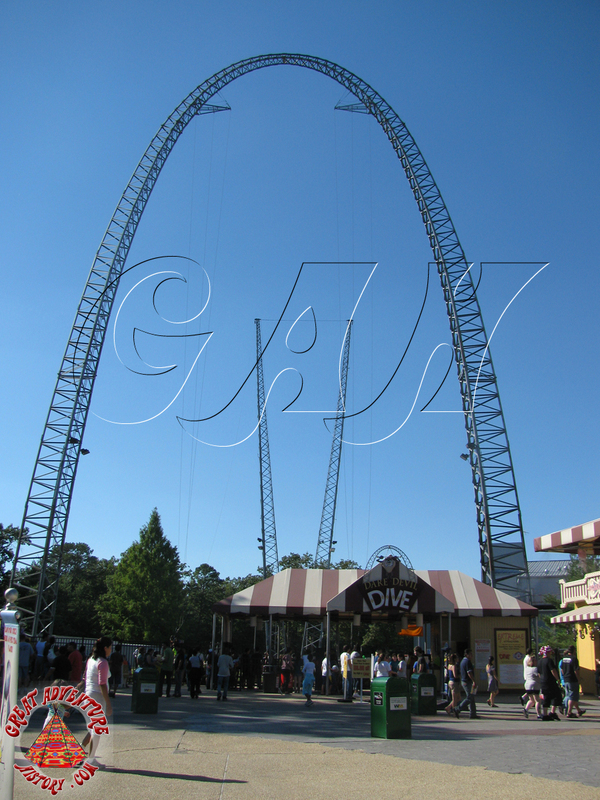 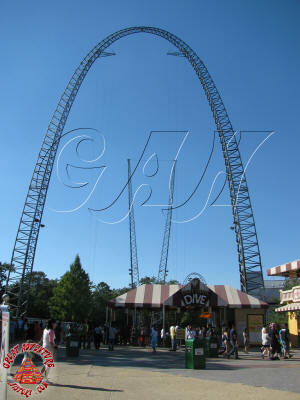 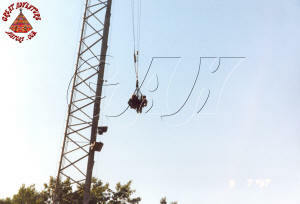 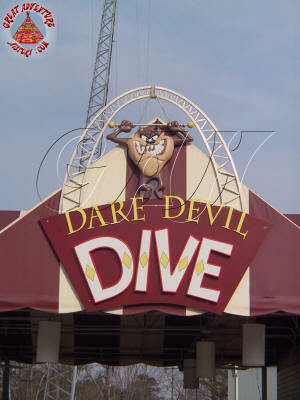 Dare Devil Dive has always been a huge draw for guests just wanting to watch from below. 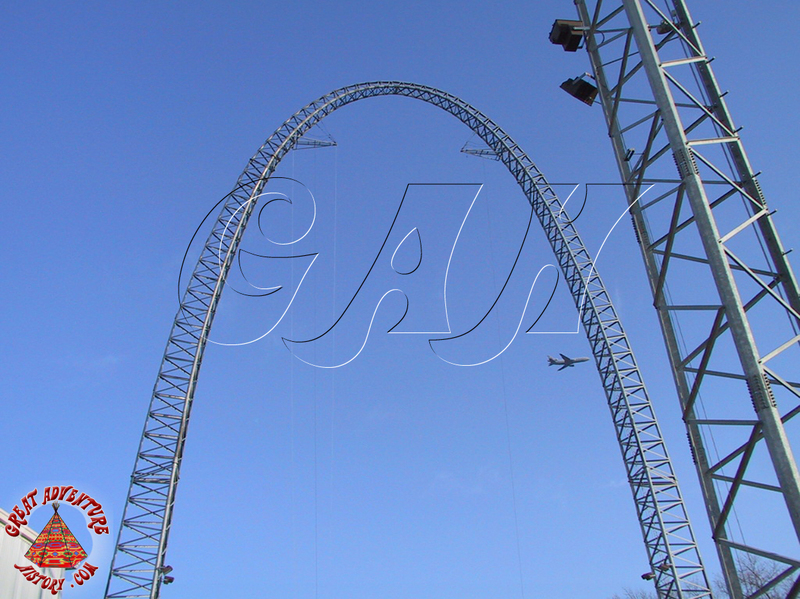 Whether they know the flyers or not, many people gather around the ride's fence or simply glance up to watch the facial expressions, sometimes with envy, and sometimes in horror, depending on the viewers courage level. The extreme attractions of Great Adventure have all had varying degrees of success and popularity except for the Dare Devil Dive which has always been popular and drawn long lines of guests. 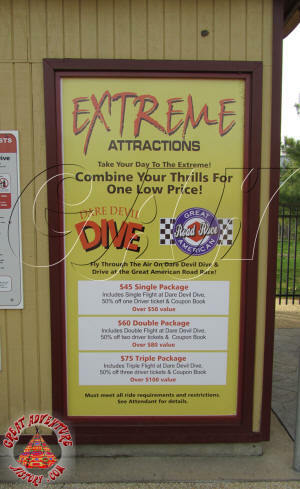 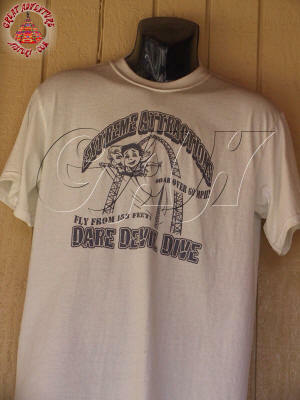 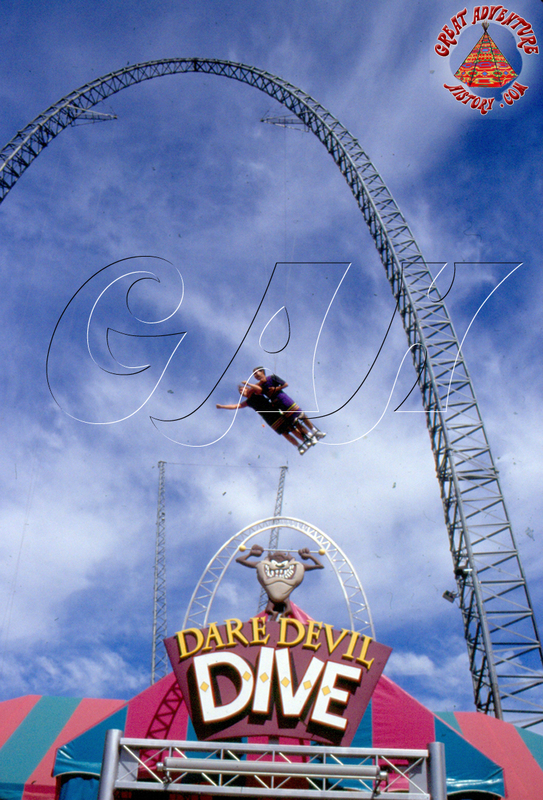 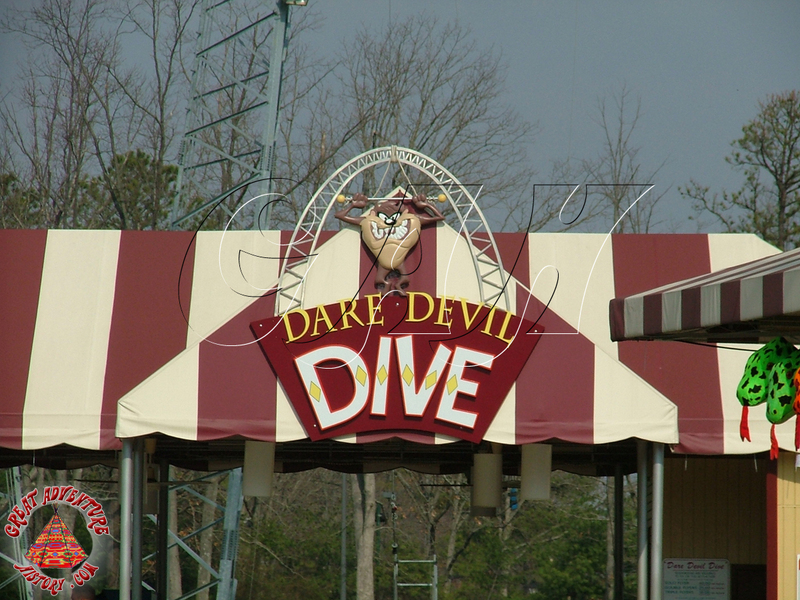 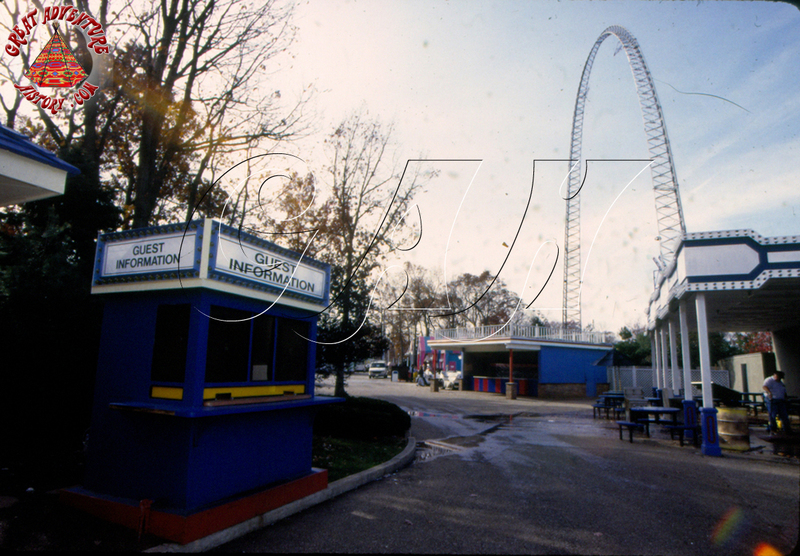 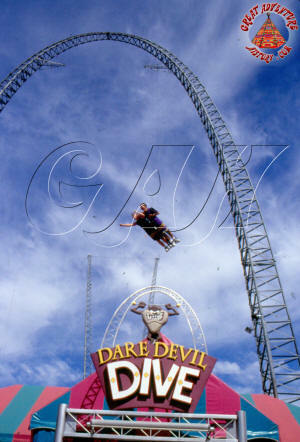 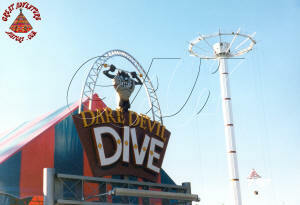 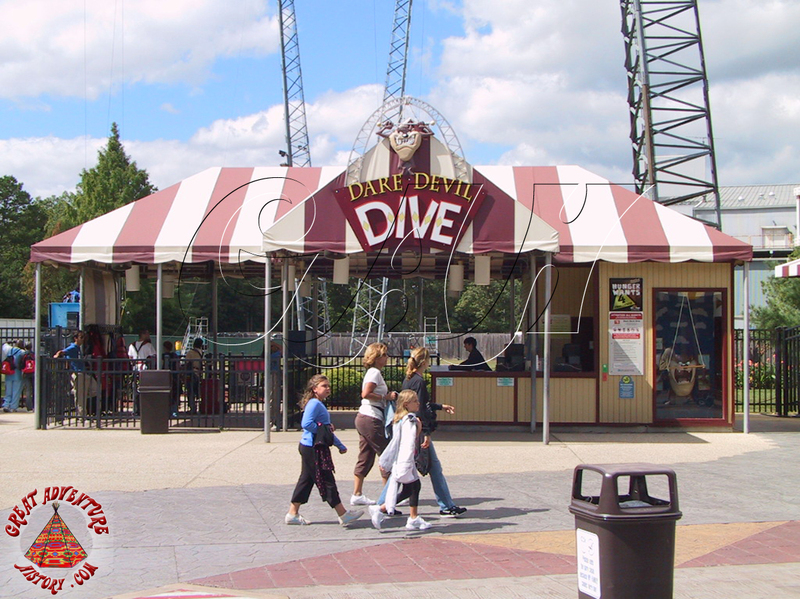 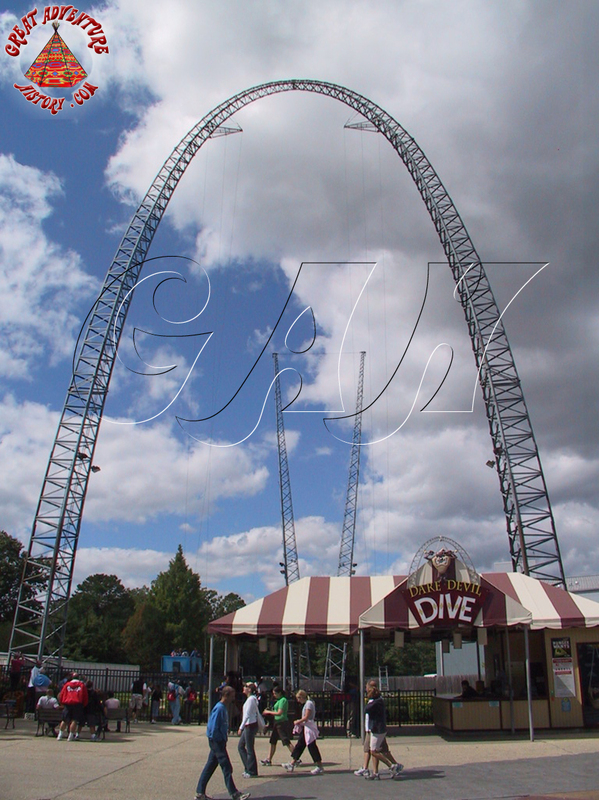 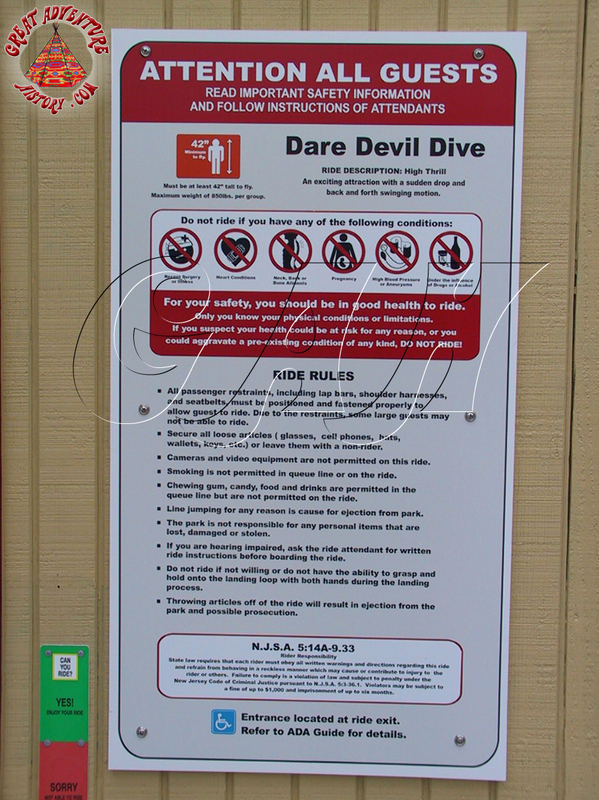 After more than fifteen seasons in the park, when other "extreme" upcharge attractions have come and gone, Dare Devil Dive remains as popular now as it was when it first opened in 1997.